Thread: The Mother of all Road Trips! I've been to that place in Las Vegas that you mentioned. Didn't have the steak, but the hospitality was first rate! We considered just leaving the tent set up at the Kerkeslin campground, since we weren’t sure how hard it would be to find another camping spot when we got closer to Banff, which was reputed to be even more crowded than Jasper. Ultimately, we decided to wing it, since we were planning to travel some distance south that day, and backtracking all the way to Jasper would have wasted a lot of time. 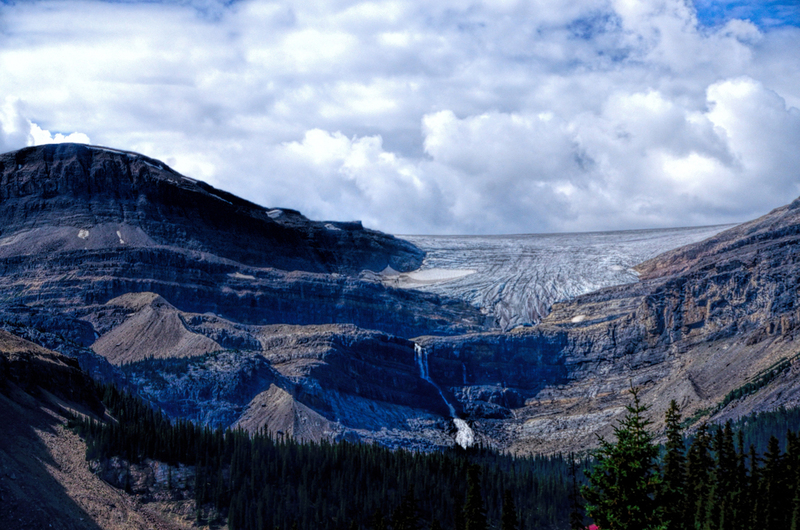 The 140 mile route between the town of Jasper and Lake Louise, in the heart of Banff, is known as the Ice Fields Parkway. This iconic road, lined by glaciers snowy mountains, and ice blue rivers, is one of the most spectacular drives on the planet! We made multiple stops for photos as we drove south. 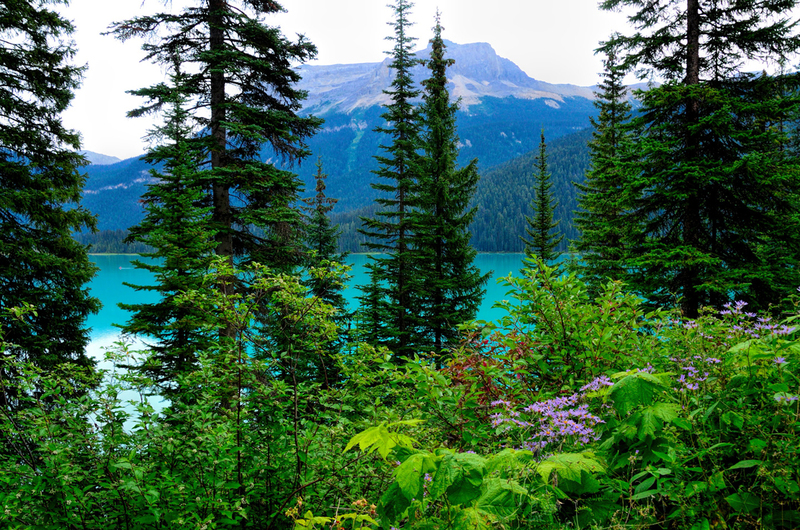 When we reached the Trans-Canada Highway, we turned west instead of continuing on to Lake Louise, which would have been just a few miles further. 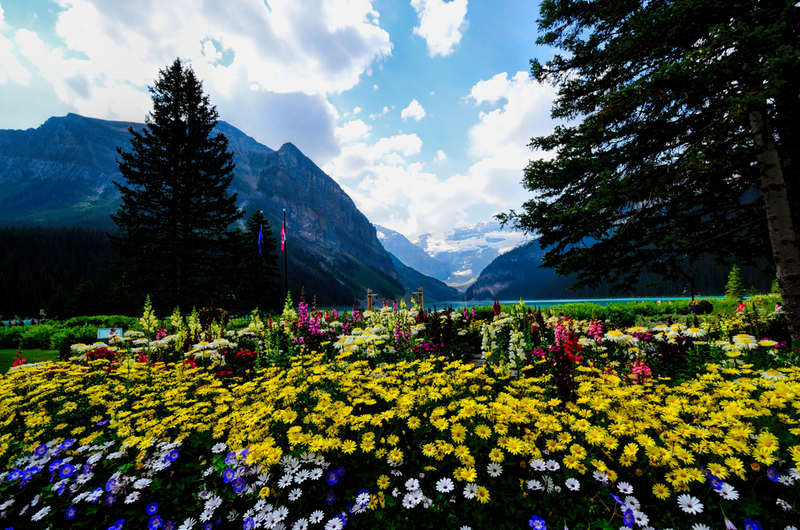 Jasper, which is Canada’s largest national park, is immediately to the north of Banff, which is Canada’s oldest and best known national park. 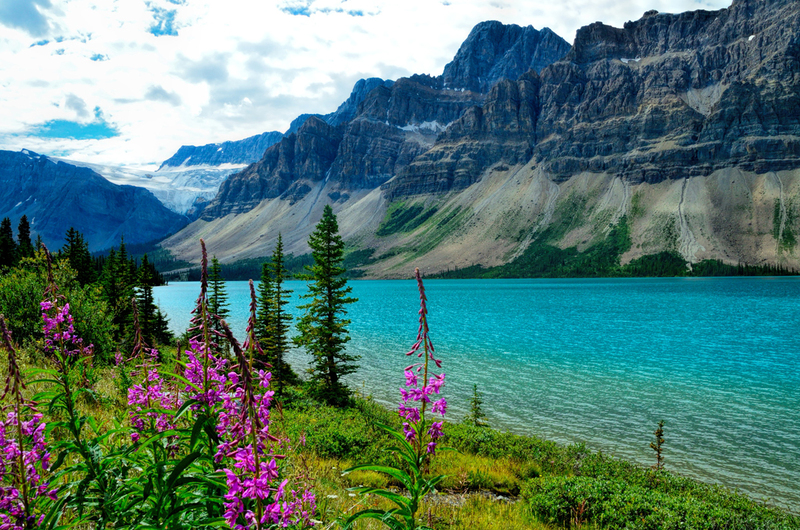 Near the junction of the Icefields Parkway with the Trans-Canada Highway, there are two more national parks: Yoho, and Kootenay. 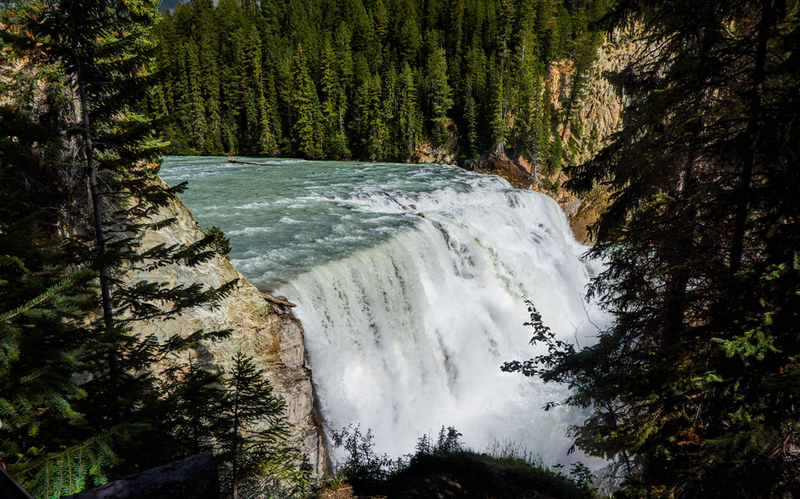 These four national parks, along with three adjacent British Columbia provincial parks, form a contiguous block of protected territory known as the Canadian Rocky Mountain Parks World Heritage Site, which contains some of the most stunning mountain scenery in the entire world. By turning right at the junction, we were headed straight into Yoho, the smallest of the four, but one of the most interesting. 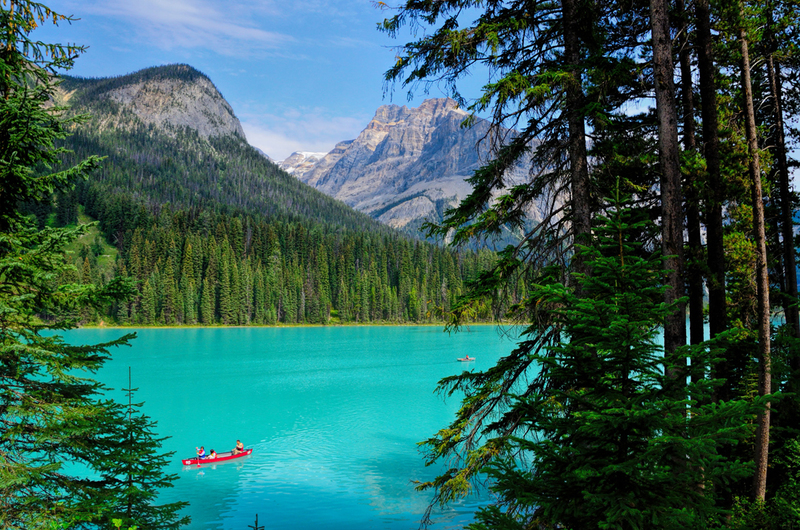 Yoho, which comes from the Cree Indian word for ‘awe and wonder’, was established in 1886. 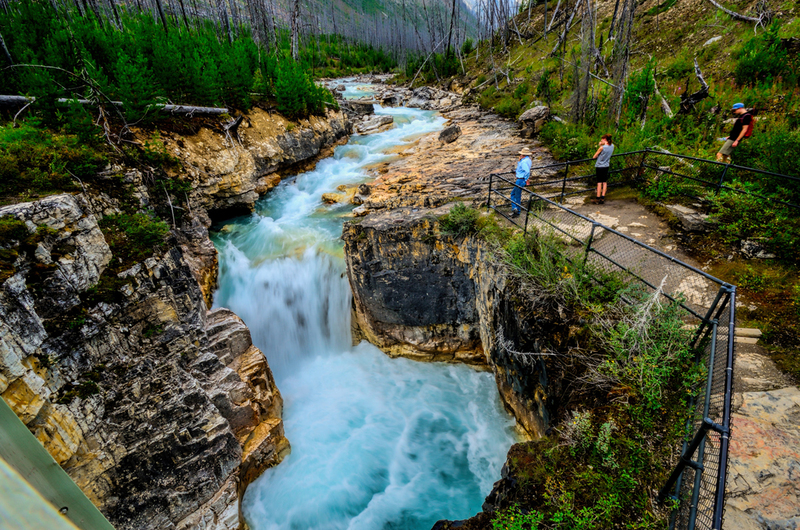 The park is famous for having some of the world’s richest fossil beds (the Burgess Shale deposits), along with fabulous mountains, forests, rivers, waterfalls, and extraordinarily beautiful lakes. 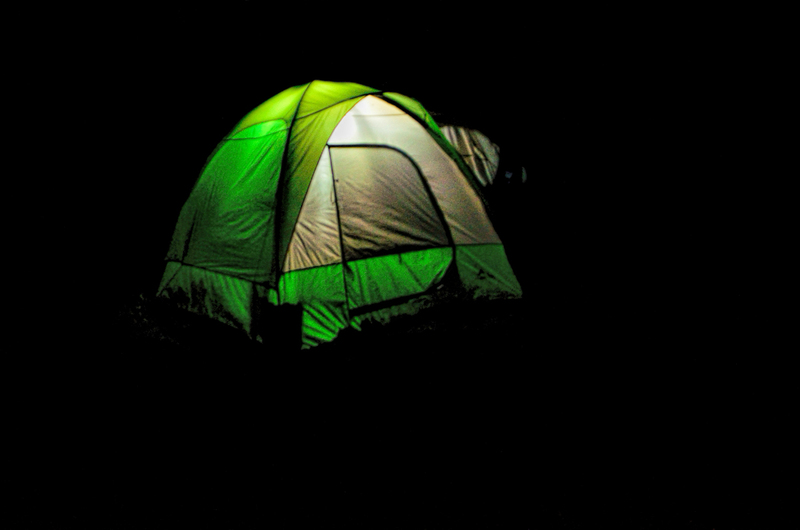 They also had camp sites available, and on a busy summer weekend, that was perhaps the most extraordinary thing of all! We stopped at the visitor center in Field to scope out the possibilities, and one of the Rangers directed us to a “Dry” (no water) campground called Hoo Doo Creek. We found the place easily enough, and set up our tent in one of the better spots. 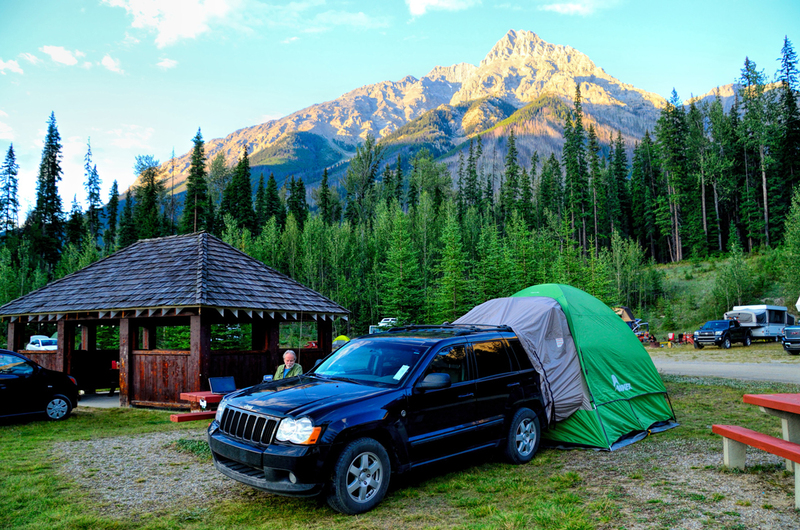 Our camp site at Hoo Doo Creek in Yoho National Park—before the campground got invaded by squatters! After the hike, we drove west a fair distance to the nearest town outside the park—Golden—where we had some dinner. By the time we got back to the campground, it had been invaded by squatters, and it was a total zoo! Apparently, when Canadians on vacation encounter a campground with no more spaces left, it’s an accepted practice to just muscle in and grab the nearest empty patch of ground. By the time the sun went down, there were more people camping “wherever” than there were in the established numbered sites like ours. The crowd was a bit unruly, and they turned our quiet, secluded campground into a noisy parking lot with zero privacy. There was so much coming and going during the night, so many bright headlight beams panning across the walls of our tent that I didn’t sleep worth a dang. This was our second night in a row camping. I told Carl that two was my limit: I was going to insist that we find a room somewhere the next night. We broke camp fairly early and drove back to Golden, where we gassed up the Jeep, and, just to shut me up, Carl booked us a room for that night at the Holiday Inn, using some leftover hotel points. 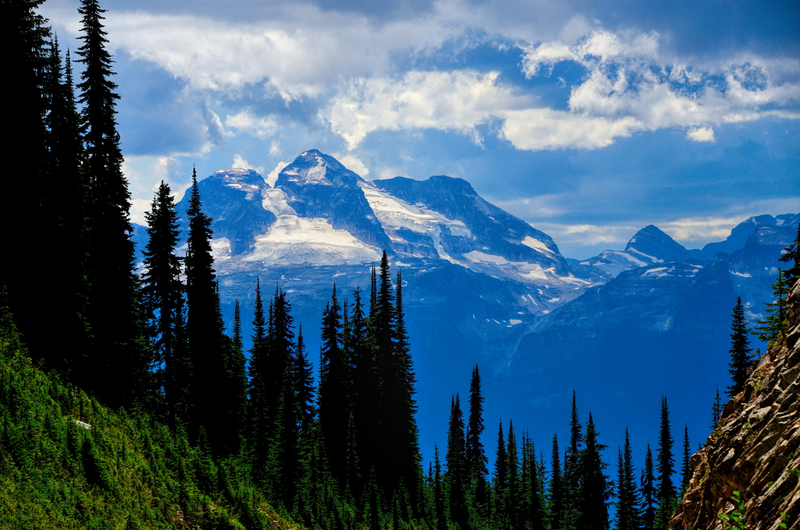 Then we drove 100 beautiful miles west to Mount Revelstoke National Park. 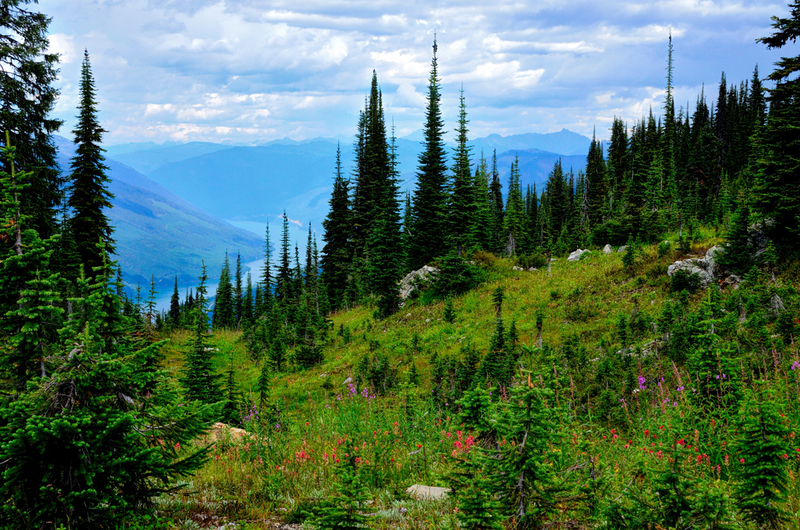 The main attraction at Revelstoke was the mountain itself, and a fabulous road that went to the top, twisting and turning like a corkscrew. My back twisted and turned just a little too much and locked up on me, for the first time since beginning this trip. It was extremely painful, and unlike my usual episodes, sitting and driving was more difficult than walking or standing. Under the circumstances, I was really glad to have Carl with me, to take over as the chauffeur while I squirmed around, trying in vain to get comfortable in the passenger seat. From the top the mountain, I took some lovely pictures of the Columbia River valley far below, framed by alpine meadows loaded with late season wildflowers. On the long drive back to Golden, we retraced our route along the Trans-Canada Highway. This time, instead of driving straight through, we made numerous stops. 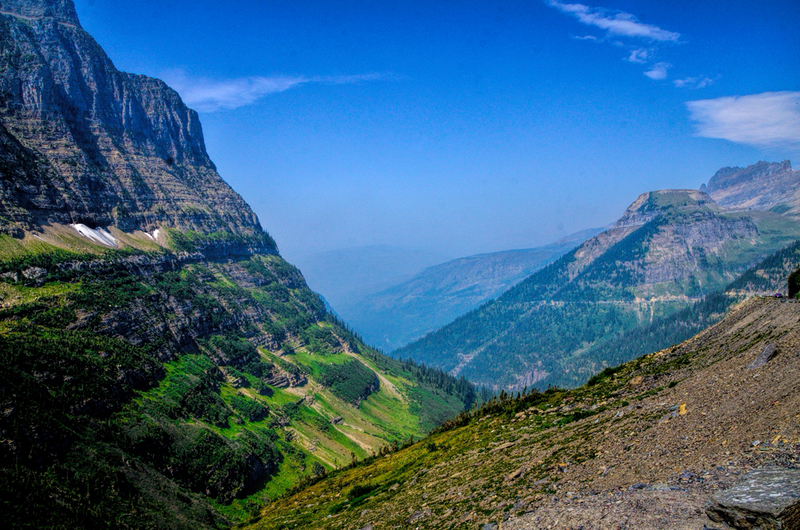 Yet another Canadian national park straddled this section of the road—Glacier National Park (which has no relation whatsoever to Glacier National Park in the United States). 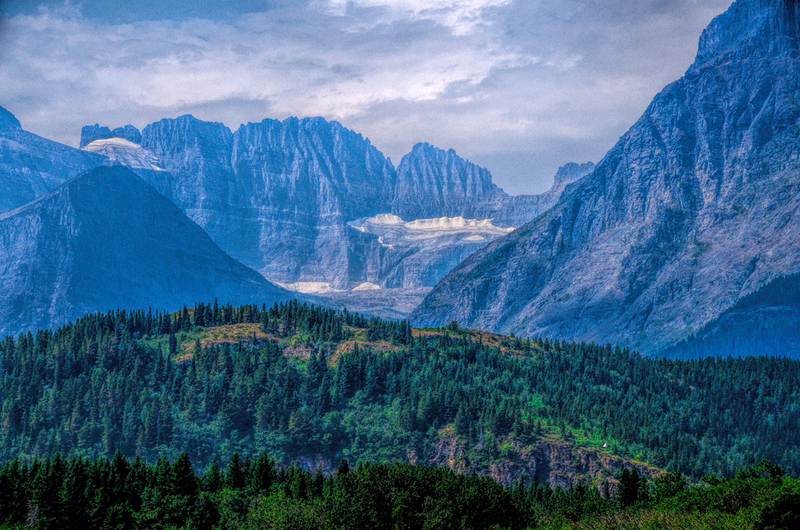 This Glacier National Park features high mountains, including Rogers Pass, a critically important route through the Rockies for both the highway and the railroad. Logically enough, there are also many active glaciers, as well as rivers, lakes, caves, and dense forests. The entire area is teeming with wildlife. 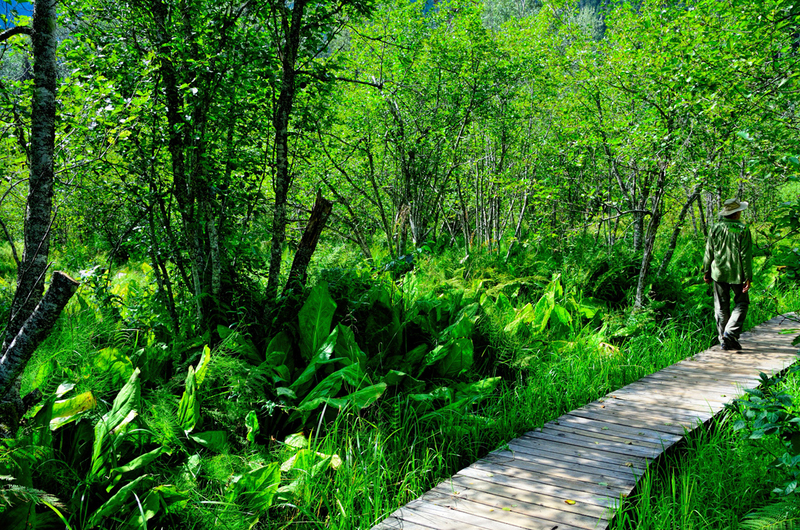 Skunk Cabbage board walk, Glacier National Park. 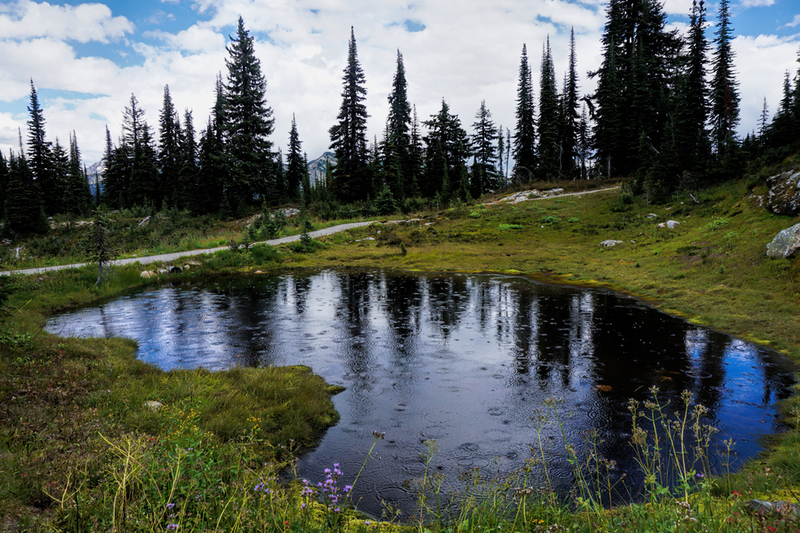 The large leafy plants are unique to the wetlands in the interior of British Columbia. They take their name from the rather pungent aroma produced when the “cabbages” flower, in early spring. 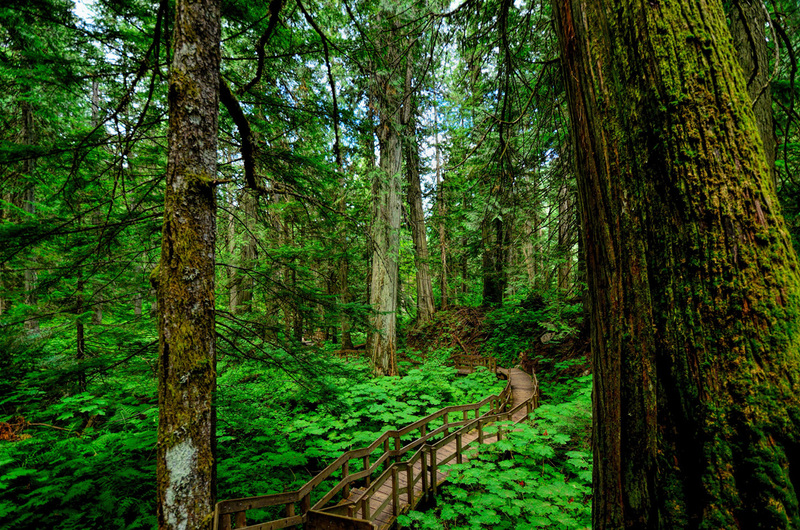 The Giant Cedars Boardwalk, in Glacier National Park. 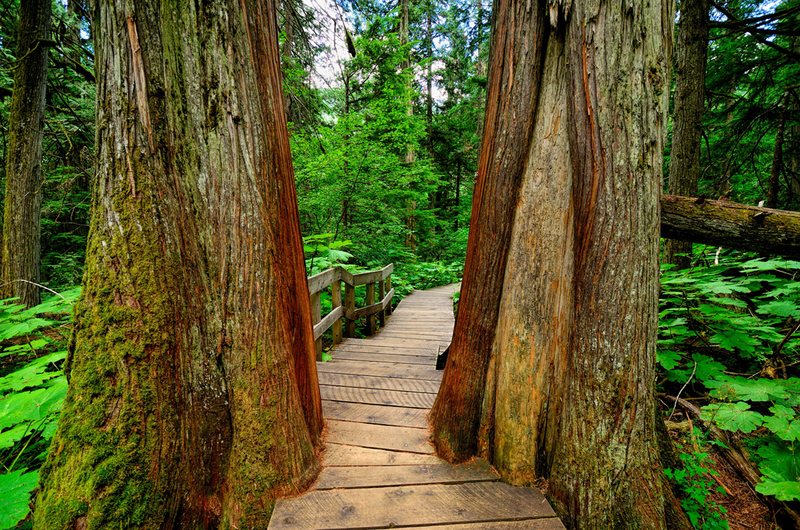 This lovely boardwalk, built of cedar planks, winds through an old growth rain forest, containing huge trees that rank among the oldest living things in British Columbia. Back in Golden at last, every hotel was booked to capacity, but we’d scored our room at the Holiday Inn early that morning, so we were, well—golden! That photo of the boardwalk made me want to do a Mary Poppins, jump into the picture and take a hike! Such a beautiful place! Keep checking back, there's more to come! (This map shows Rick's route between Mount Revelstoke, British Columbia and Lethbridge, Alberta. The following areas that Rick visited could not be mapped this time of year, due to winter road closures -- this is a Google Maps policy -- but we'll add these maps later in the year. 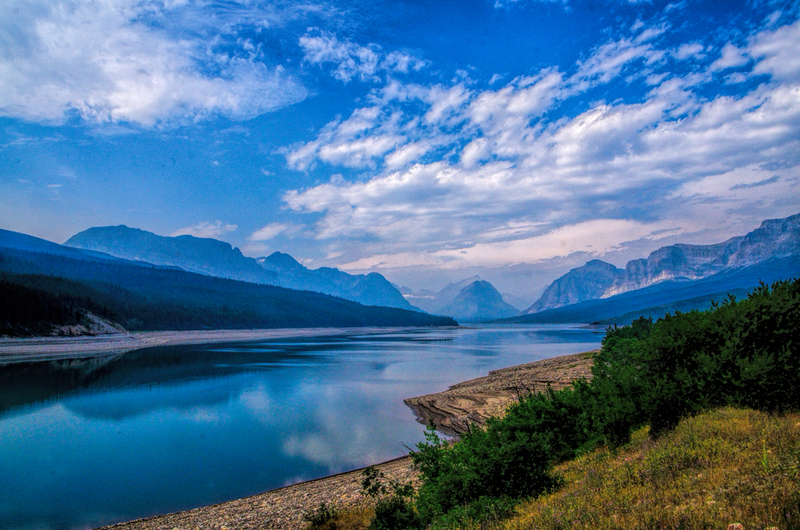 The areas excluded included Cameron Lake, Red Rock Canyon, and Red Rock Parkway in the Waterton Lakes National Park). 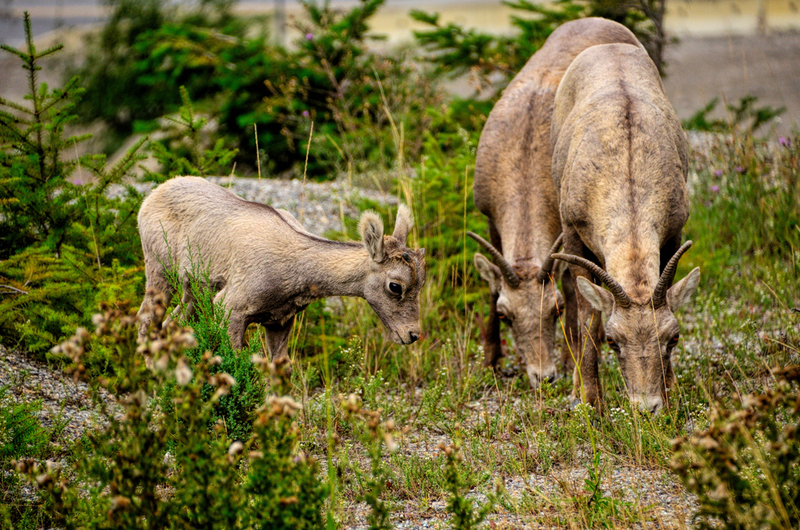 Mountain sheep, grazing beside the Trans-Canada in British Columbia. The animals were obviously quite accustomed to being around people, as they took no notice of us, much less of the traffic whizzing by on the busy highway. The Trans-Canada cuts right through the middle of Yoho National Park, and the turnoff for Emerald Lake was right near the main Visitor’s Center in Field. We drove five miles or so into the woods until we reached a very busy parking area. Our first views of the lake were through breaks between the trees; we couldn’t see the whole thing, just snatches of it, but the color was astonishing, unlike anything I’d ever seen! This lake, which is fed by snow melt and the outflow from surrounding glaciers, is loaded with fine silt composed primarily of powdered limestone, a unique variety of “rock flour,” created by the abrasive action of glacial ice grinding its way down rocky slopes. 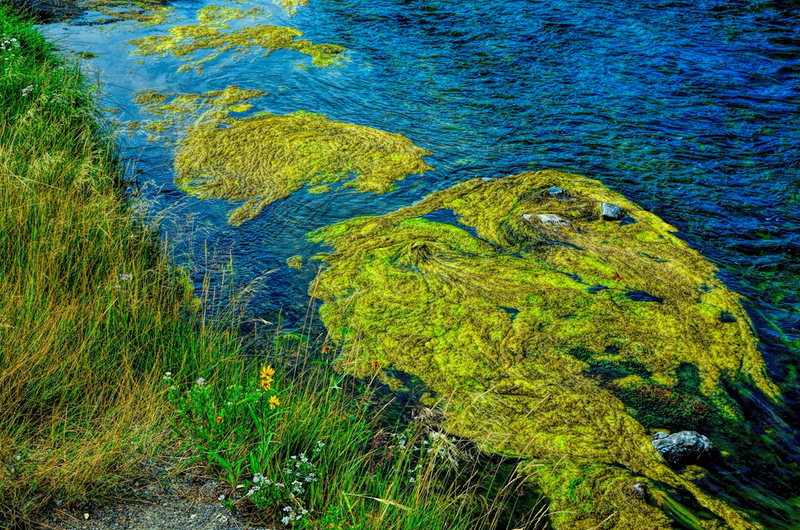 The rock in this area is particularly rich in calcium carbonate, which refracts the blue, and especially the green spectrum of light, imparting a vivid hue to the water. The relative concentration of suspended minerals changes with the seasons, and, as a result, so does the color of the lake. Early August was apparently a fine time to visit, and as a result there were crowds, including a fair number of chartered tour buses. I can’t speak for my friend Carl, but personally, the crowds didn’t bother me. I was in awe of that lake, which has to be one of the beautiful bodies of water I’ve ever seen. We spent an hour or two exploring the area, hiking some of the trails that encircle the lake, and drinking in the views. 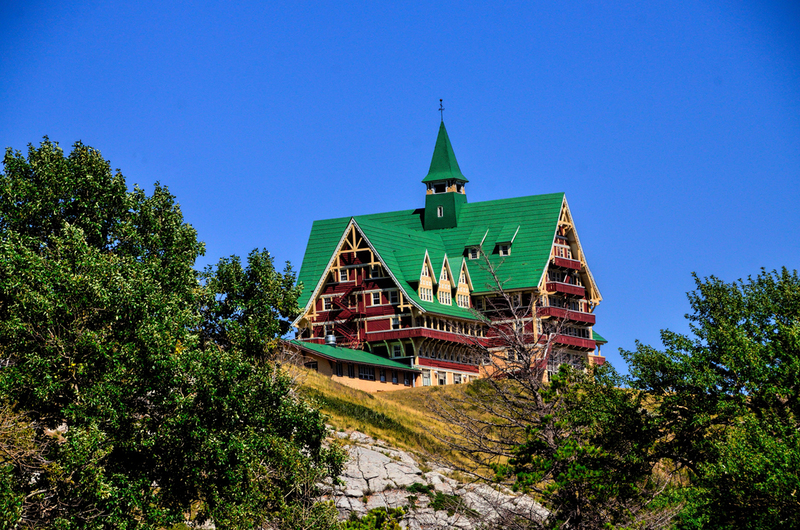 The Emerald Lake Lodge is a high-end establishment situated right on the lake shore, and many of the rooms have a view. It would be an ideal spot for a romantic getaway, but in the peak summer season (when the lake is at its greenest) you’ll pay dearly for the privilege. That’s where we were headed next. 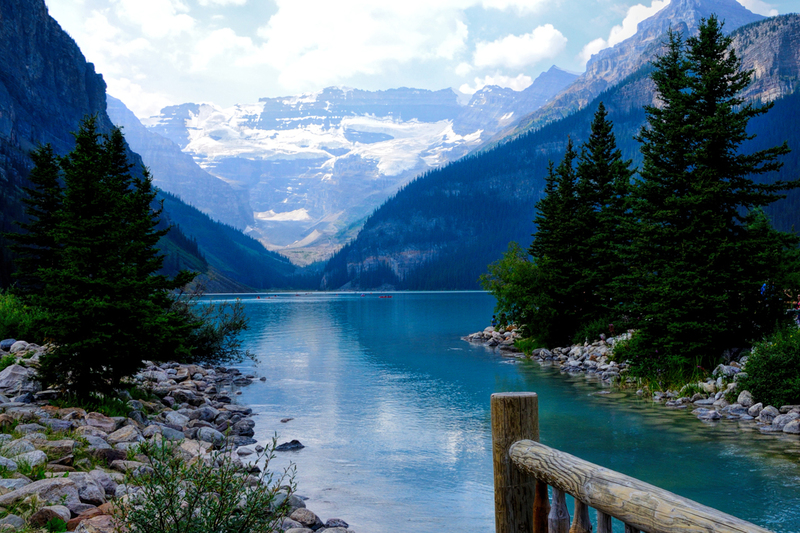 Lake Louise is the most famous attraction in the Canadian Rockies. 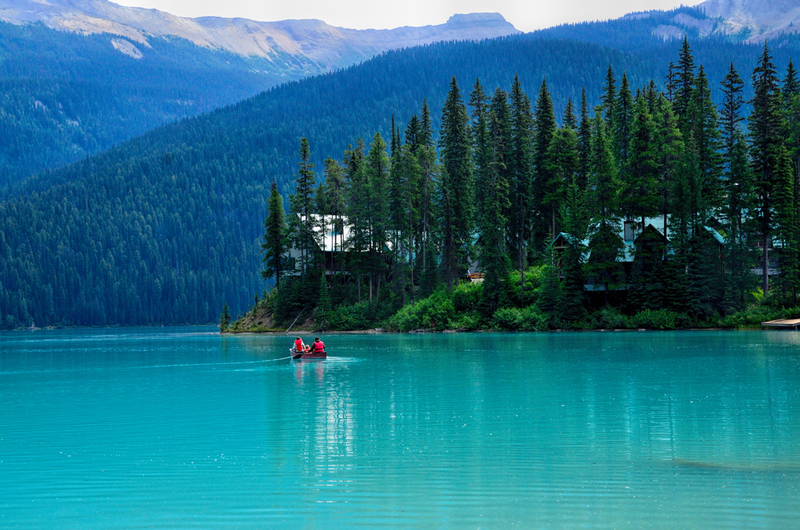 An emerald colored lake backed by glacier-clad mountains, site of an iconic, World Class hotel called the Fairmont Chateau Lake Louise, built more than 100 years ago by the forward thinking owners of the Canadian Pacific Railroad. 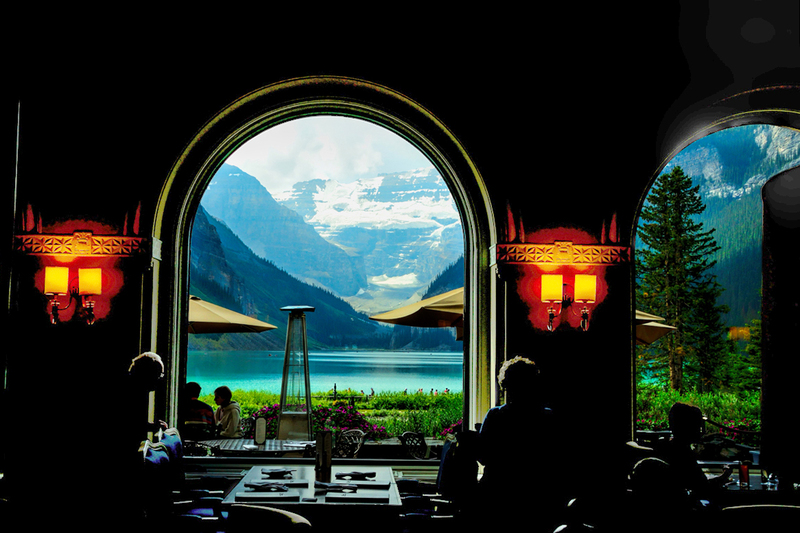 The setting—the Lake, the mountains, and the magnificent hotel forms a tableau like no other, and a destination that draws travelers from all over the world. In practical terms, that popularity translated into ridiculous crowds. The available parking was woefully inadequate, giving rise to a situation much like what we experienced at the campground in Yoho. People who couldn’t find a legal parking place simply parked their cars on any available plot of ground: driveways, fire lanes, access roads, grassy medians. That “to-heck-with-it” attitude created a fair bit of chaotic gridlock as drivers vied for parking spaces that didn’t really exist. When we finally found a spot to park the Jeep, we set off toward the hotel and I spotted a Park Ranger walking around with a clipboard, jotting down license numbers. “Do you guys even DO anything about this?” I inquired, pointing toward a long row of vehicles parked along a sidewalk. I took some comfort from that, because I’d just spent one heck of a long time driving in circles before finally getting lucky. We spent perhaps an hour wandering around. The lake is gorgeous, every bit as lovely as advertised, and I took some great photos. 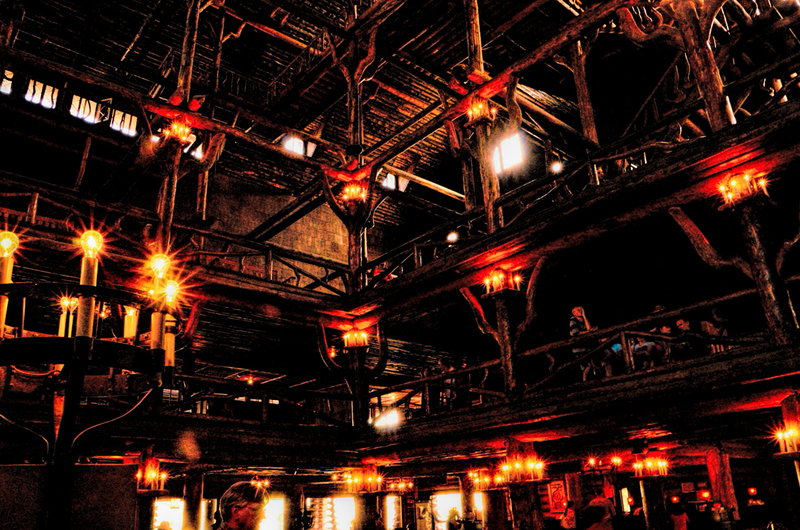 Even still, if I’m being honest, the crowd spoiled it for me, and as beautiful as it was, I’d have to say that I liked Emerald Lake much better! Do me a favor, and please, don’t tell anyone! 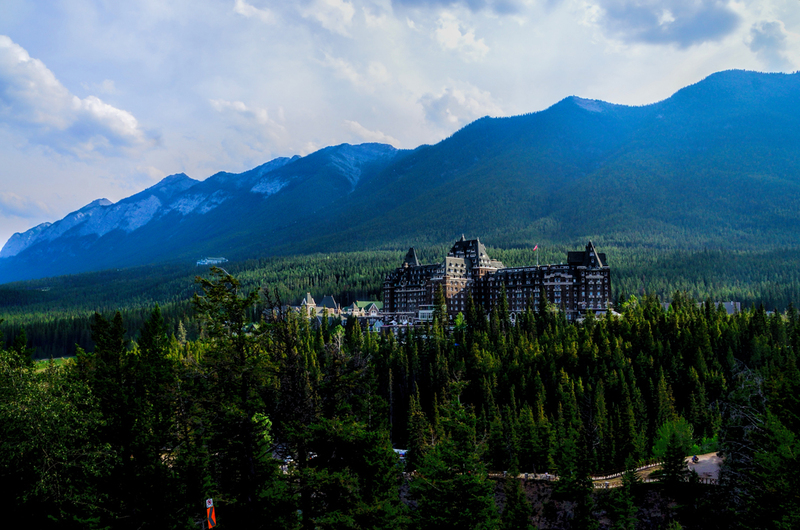 If the world finds out about it, they’ll overrun Yoho the same way they overran Banff! After we left Lake Louise, we drove 25 miles or so to a place called Marble Canyon, at the north end of Kootenay National Park, which abuts the southwest corner of Banff. This was a very cool spot: a fast-flowing creek walled in by an extremely narrow, dramatically steep sided gorge. There are multiple waterfalls within the gorge, and the water is that same extraordinary blue-green as the glacial lakes. A paved walkway runs along the edge of the gorge, and there are multiple observation points. 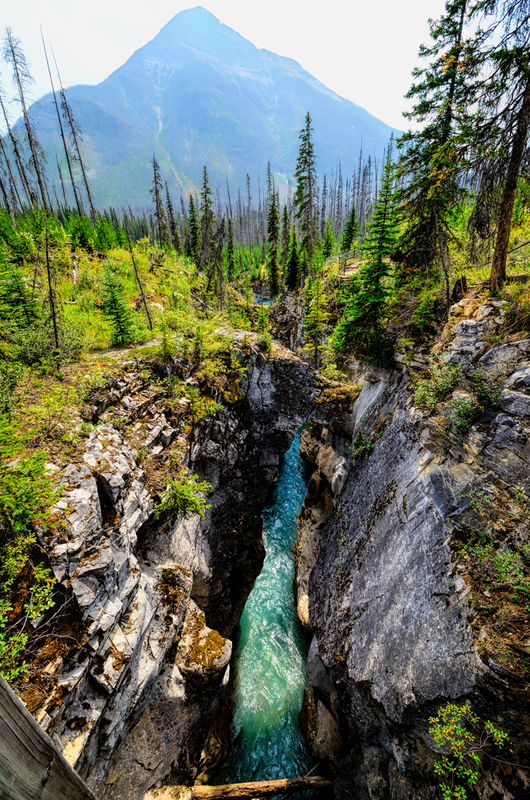 Marble Canyon is one of many worthwhile things to see in Kootenay, but it would have taken more time than we had to spare, so we turned around and headed back to the town of Banff, where we hoped to find a campground with space available. We did indeed find a good spot to camp, just outside of Banff. We paid the fee and set up the tent, and then, because we hadn’t yet run out of daylight, we took a drive around the area, to see what we could see. 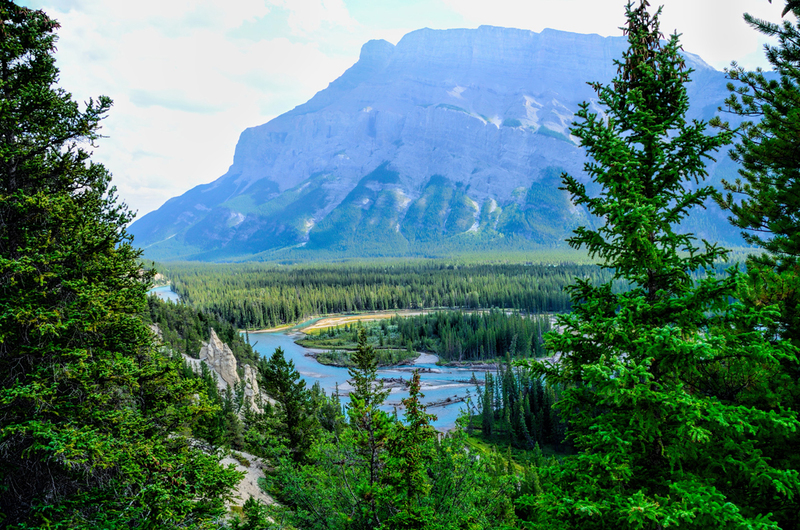 We found a fantastic overlook on Tunnel Mountain Road, with a fabulous view of Mount Rundle and the Bow River. There was a footpath from the overlook, the Hoodoos Trail. We hiked a short distance for a better look at the hoodoos. 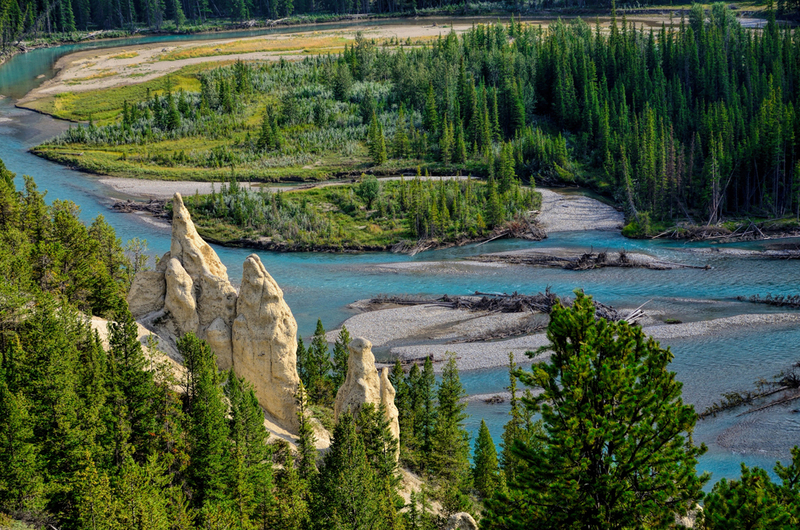 Certainly not the biggest or most colorful hoodoos I’ve ever seen, but the setting? Oh, my! After our little drive, we had dinner at a decent restaurant in the town, and then we crashed at our reasonably comfortable camp site. The next morning, we packed up and drove east out of Banff toward Calgary, turning south on AB Route 22 just before we got to the city. 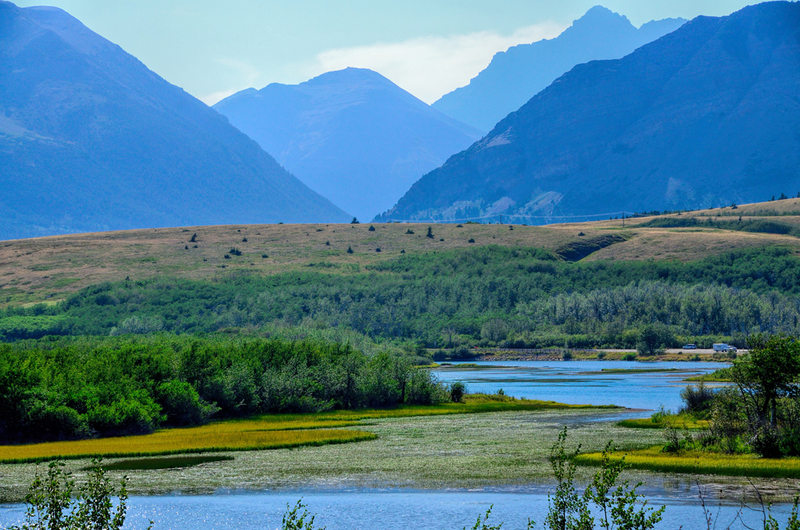 From there, we drove close to 200 miles more to Waterton Lakes National Park, the last of the Parks in the Canadian Rockies, right on the border with Montana. 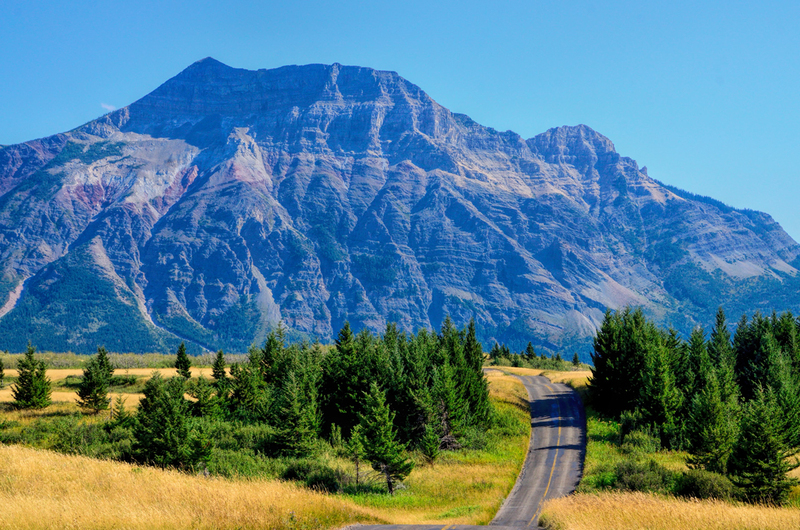 Waterton Lakes is known as the place where the mountains meet the prairie. 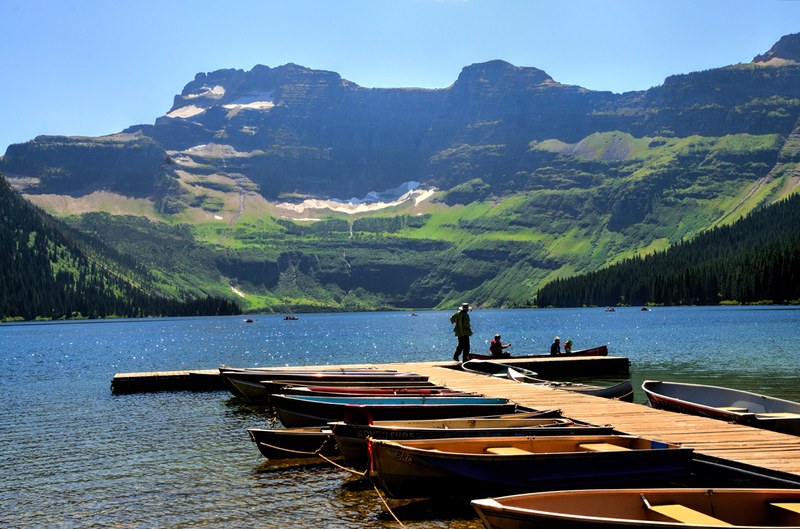 It is immediately adjacent to Glacier National Park in the United States, and the two beautiful parks taken together are known as the Waterton-Glacier International Peace Park. 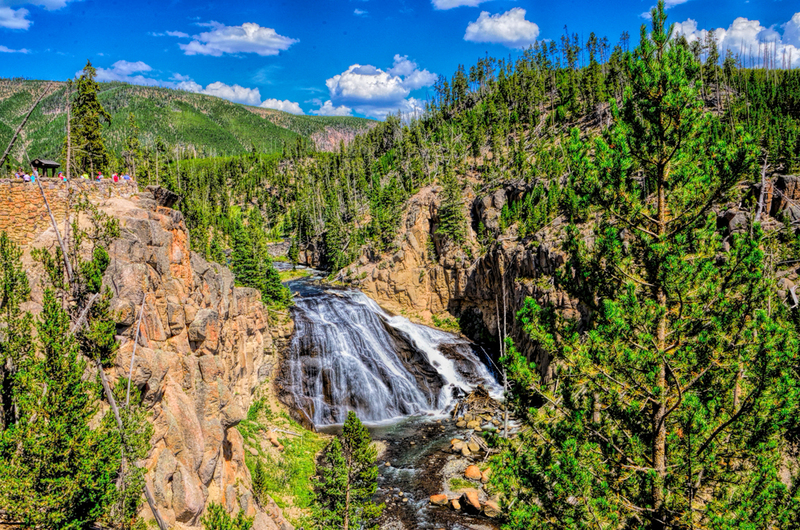 As might be expected from the name, water is a central feature in this park, which boasts lakes, streams, waterfalls, and wetlands, in addition to the stunning mountain scenery. 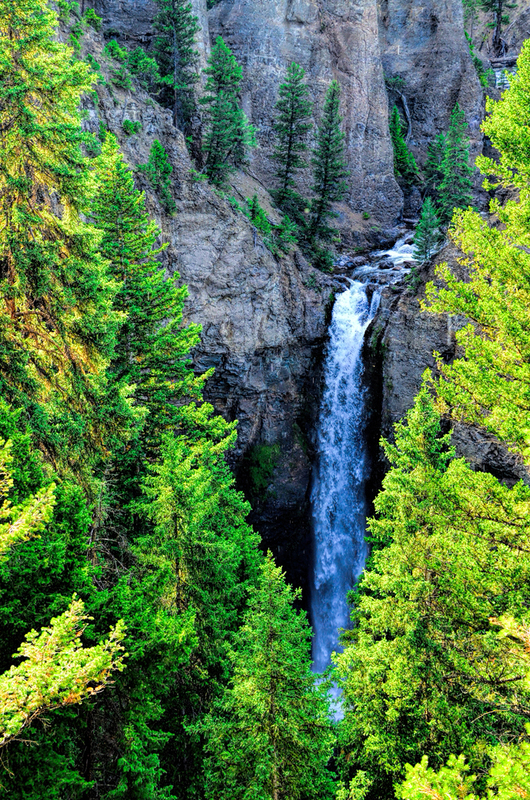 Right near the town of Waterton there is an unusual crisscross cascade called Cameron Falls. This waterfall is pretty cool on a normal day, but during periods of heavy rain, there’s not only more water flowing, there’s also an unusual red sediment that washes down the stream and turns the falls a lovely shade of pink. 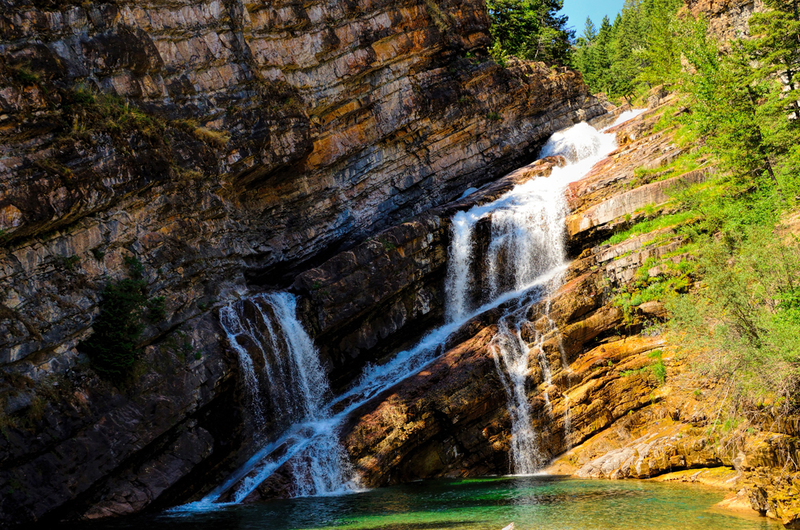 Cameron Falls, a most unusual three-way waterfall in Waterton Lakes National Park. 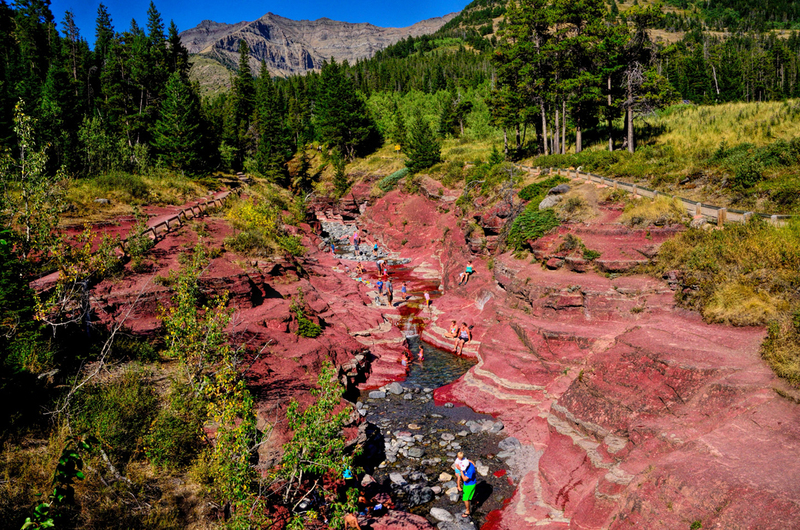 Under certain conditions, reddish sediment washes into the stream and turns the cascade pink! We spent several hours exploring this remarkable place, driving just about every road, and seeing some very cool views. Like everywhere we’d been so far, the park deserved a lot more time than we had available. My friend was on a schedule: we had to get him to Salt Lake City by the morning of the 17th, just six days away, to catch his flight back to San Francisco. We had a lot of miles to cover, and there were some seriously amazing attractions along the way. 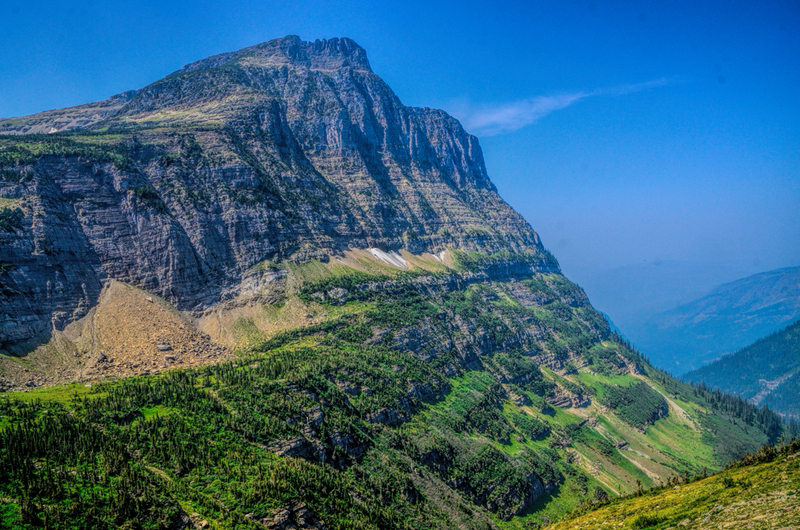 Red Rock Parkway, Waterton Lakes N.P. From Waterton Lakes, we took AB-5 east and then north to the town of Lethbridge. That was nearly an hour out of our way, since we were headed back to the U.S., but Carl had a friend in Lethbridge, the son of a Canadian foreign service officer that Carl worked with when he was stationed in Pakistan, quite a number of years before. The young man, Philip, had been just a boy the last time Carl saw him; Carl's own kids were about the same age, and the two families spent a fair bit of time together over the course of several years in that very foreign country. Philip was all grown up now, a newly minted barrister doing a two year stint in this “frontier outpost” as a prosecutor for the crown, getting trial experience, learning the ropes. Philip and his fiancé, also a new attorney, had a lovely home, and they bent over backwards to make us welcome. Showed us around the town, cooked us a great dinner, and put us up for the night. It was an enjoyable evening and a delightful change of pace; in the scheme of things, well worth the extra time and mileage. Next up: Back in the U.S., back in the U.S., back in the U.S. of A! “Old friends since high school!” we chimed in unison. That was the full extent of our Customs inspection, so off we went down US 89. 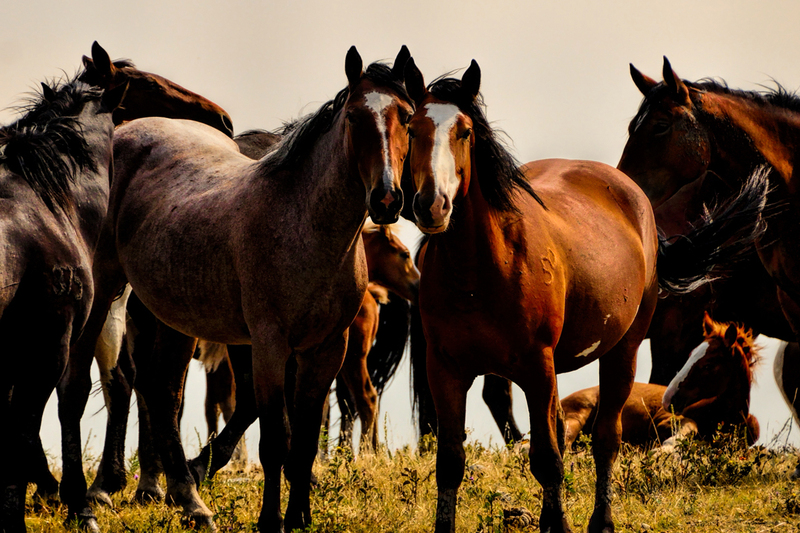 As we drove along, we spotted a small herd of beautiful horses gathered in a pasture alongside the road. We stopped to snap a few photos, and they struck some terrific poses for us. They weren’t wild horses; I could read the brands on several of the animals through my telephoto lens, but they weren’t docile domesticated beasts, either. You could see it in their attitude: proud, perhaps a bit haughty, free to run and wander at will across a vast territory, in the manner of their feral ancestors on the Eurasian steppe. We watched them, just for a short while, until they all took off at a gallop, manes and tails streaming, a magnificent spectacle. This was an “only in Montana moment,” and it happened for us less than five minutes after entering the state! Ten miles south of the border crossing we came to the town of Babb, where we turned west on Route 3, which follows a fast running stream into the Many Glacier section of Glacier National Park. After about 5 miles we came to a small dam that widened the stream into a fair sized body of water known as Lake Sherburne, and a couple of miles beyond that was the Many Glacier entrance to this extraordinary National Park. There was no fee to enter—not for us, anyway, thanks to my dearly beloved lifetime Senior Pass—so we drove right in with a smile and a wave. The scenery was, in a word, stunning. We were immediately adjacent to Waterton Lakes National Park in Canada, but the views here were dramatically different. The mountains were bigger, the vistas were wider, and the sky! 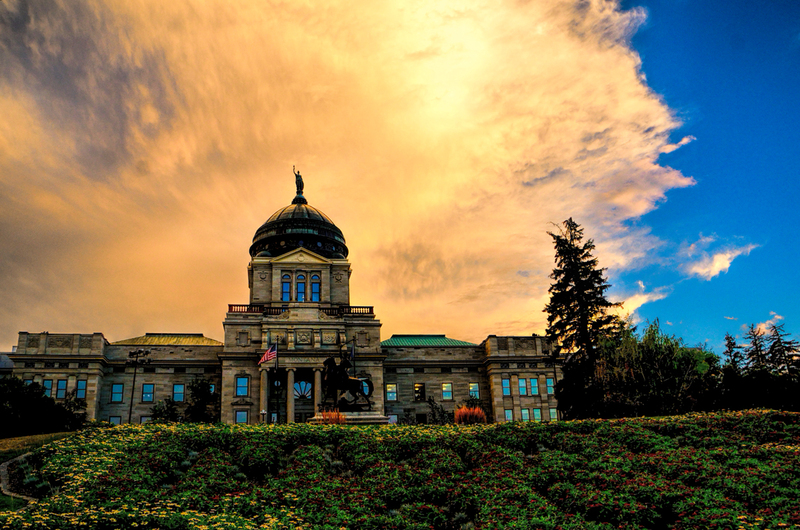 That classic “Big Sky” of Montana, spread across what seemed a limitless horizon filled with extraordinary clouds, but, sadly, at least partly obscured by a smoky haze. 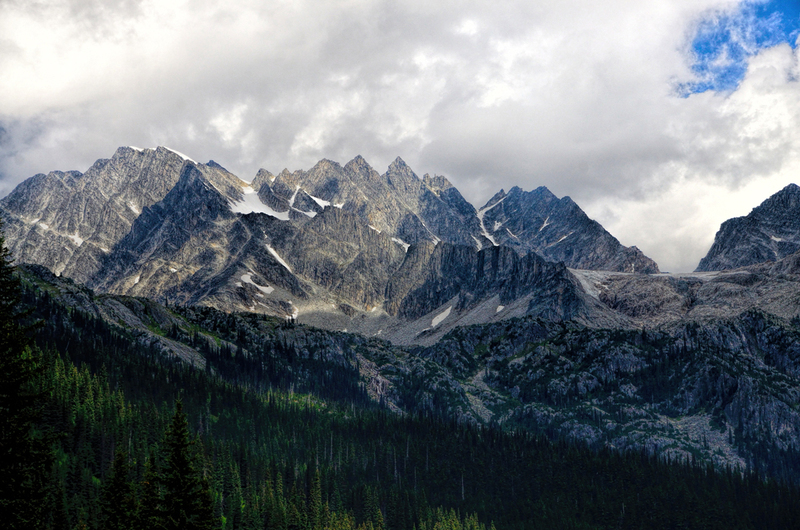 Mountains and Glaciers and Clouds, oh my! The further we drove, the more extraordinary the views; the sort of place that leaves the most jaded world traveler wide-eyed in wonder. Sadly for us, despite the relatively clear skies, the smoky haze was a constant. The summer of 2015 was particularly bad for wildfires in that part of Montana; there was a big one in the eastern section of the National Park that had been burning since mid-July, destroying thousands of acres of pristine forest and casting a pall across the whole region. That fire was barely contained, and just two days earlier, lightning had sparked yet another huge fire in the south central section of the park, bringing the number of active fires to three. The Many Glacier area was spared from the worst of it by fortuitous geography; the advance of the flames, as well as most of the smoke was blocked off by a steep wall of mountains. Route 3 ended at a built up area with a motel and campground. About half a mile before the end of the road was another parking area, with a fancier hotel; from there, we hiked a very short trail to a very cool spot: Swiftcurrent Falls, a cascade that tumbles down a steep rocky ravine, with a pyramid-shaped peak, Mount Wilbur, nicely framed in the background. 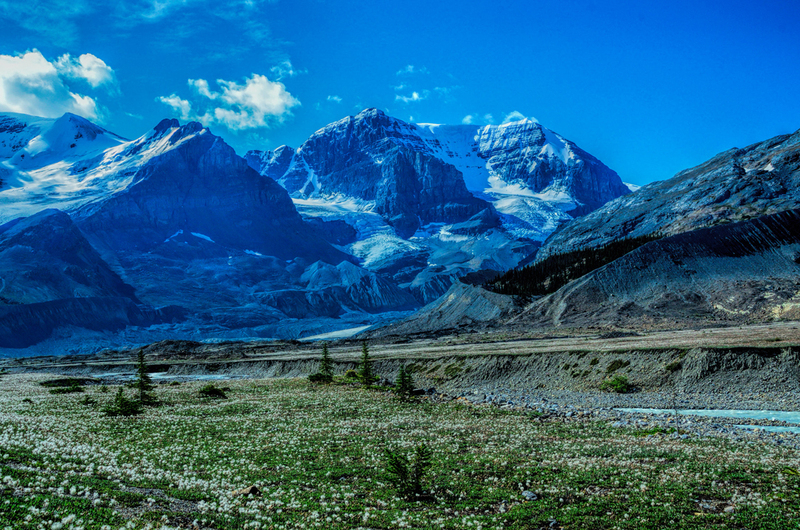 We reversed course and drove back out of the Many Glacier area, all the way back to Babb, where we rejoined US 89. South from there along the shore of Lower Saint Mary Lake to the itty bitty town of Saint Mary, where there are some shops and eateries, a campground, and a National Park Visitor Center. 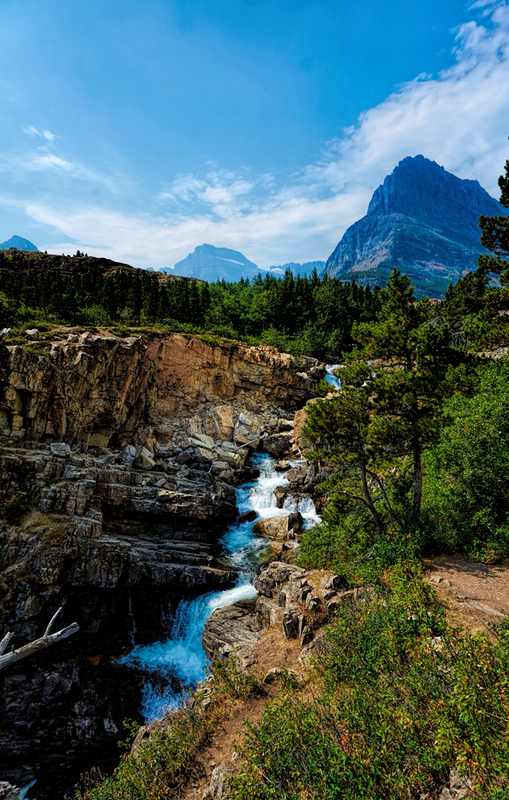 Saint Mary is the main eastern entrance to Glacier National Park, and it’s the turn-off for the Going-to-the-Sun Road, an extraordinary 50 mile-long scenic drive that traverses the width of the park, crossing the continental divide at 6600 foot Logan Pass. This road, built in the 1920s, receives snowfall amounts that are biblical in proportion; it can take as much as ten weeks to clear all that snow off the road every spring, before they can open it for the all-too-brief summer season. In 2015, the short season was further abbreviated by the smoke from the wildfires, which was so dangerously thick they’d been forced to close the road altogether for most of the previous month. The day we arrived was the first day the iconic road was open again, so of course we had to drive it, despite the smoke and haze. 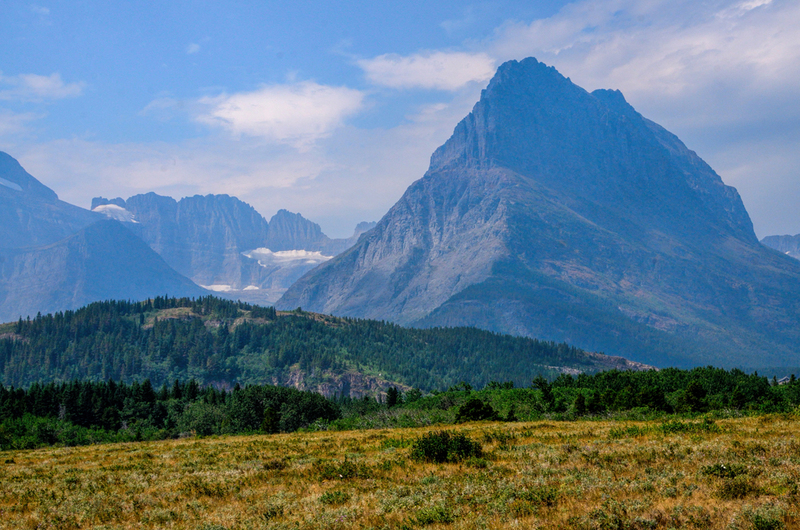 One thing that was actually in our favor: the fires had caused so many travelers to change their plans, Glacier N.P. was significantly less crowded than usual, and the volume of traffic on the scenic road was a fraction of what it would have been on a normal day in August. That said, the smoke, most of it from the new fire burning to the south, was so heavy in the air that we could scarcely see the mountains; at one point, we drove through an area of blackened trees, where the fire had burned a swath through the forest on both sides of the road, leaving behind the stench of smoldering ash. This was far worse than my experience on Hurricane Ridge in Olympic National Park (See post #14 in this thread); this was so bad that it was hardly worth the trouble of making the drive, and at that, it was quite a disappointment. Having had plenty of experience driving in fog and other questionable weather, I’ve found that when distant views are obscured or otherwise unavailable, it pays to slow down and pay extra attention to the road, and the roadside. 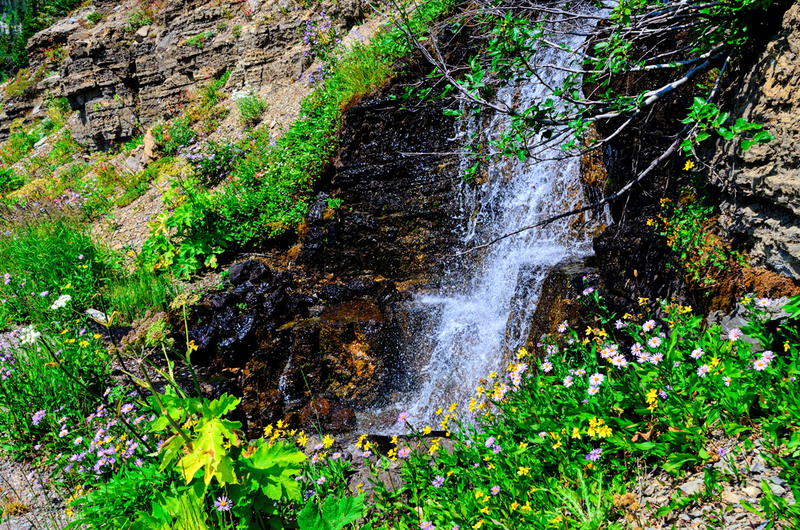 On Going-to-the-Sun, that old habit paid off when I spotted a lovely little waterfall, surrounded by wildflowers. Felt like a long day, but it was definitely a good one! 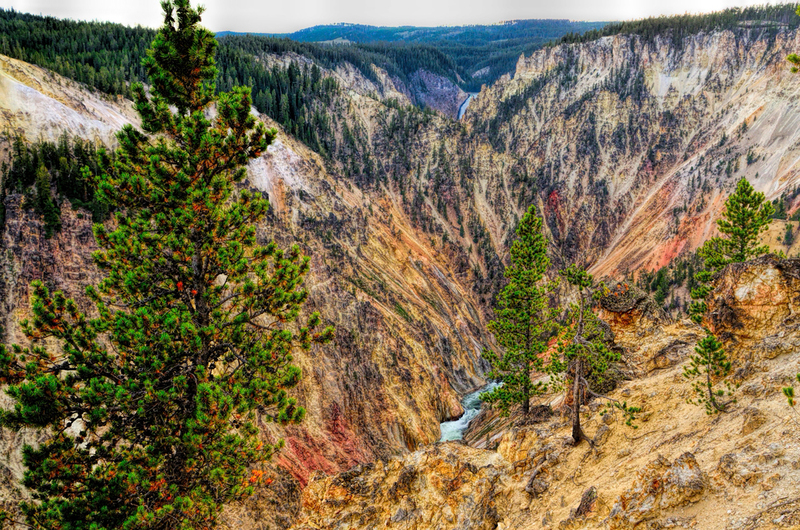 Yellowstone: the north loop of America’s premiere National Park! We got an early start out of Helena, and made short work of the drive south to West Yellowstone: I-15 to MT-69, MT-69 to MT-2, and MT-2 to US 287, which took us on to our destination, all in just under three hours. That put us at the gateway to the National Park by about 10:30 in the morning, and our first rather urgent order of business was figuring out where we’d be staying the night. 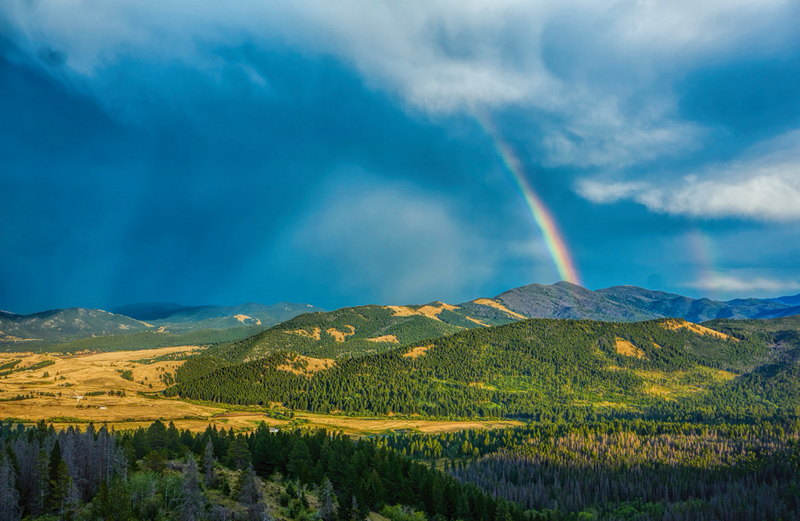 Hotels and campgrounds in and around all popular National Parks are booked solid throughout the peak season of the summer months; that’s especially true at Yellowstone, but we were traveling without a fixed itinerary, so we had NOT planned ahead. We stopped at the West Yellowstone Visitor Information Center, and I asked what had become my standard question: were there any first-come, first-served sites for tent camping available anywhere in the area? They directed us to a National Forest campground called Baker’s Hole, just 3 miles away up US 191, and sure enough, right at that moment, there were at least a dozen people packing away their gear and leaving spaces up for grabs. We snagged a good one, and set up the tent to solidify our claim on it. Then we headed for the park! Yellowstone N.P. was a bucket list item for me, one of a whole set of “must-see before I die” destinations that were getting checked off, one after another, as the Mother of All Road Trips roared along into the home stretch. I was going to be back in Arizona in less than a week, and I really wanted to make the most of these last few days, to wrap up this epic journey on a high note! The fee station at Yellowstone’s West Entrance had four lanes, and all of them were backed up with long lines of travelers eager to begin their adventures in this one-of-a-kind place. At least half of the vehicles were big RV’s, and it seemed to be taking everyone forever to perform the simple action of paying their fee, collecting their park brochures, and moving along! When my turn finally came, I handed over my Senior Pass, along with my driver’s license. No wasted motion, no idle chit-chat, and we were out of there in less than 30 seconds, with big smiles all around. There are 142 miles of roadway in Yellowstone, and I wanted to drive them all! Next, we drove north toward the Norris Geyser basin, stopping at most of the turnouts for attractions like Beryl Spring, a hot spring with clear, translucent water the color of blue sapphire. I’d seen hot springs before, but never anything like this! The water was bubbling like a pan of boiling water on a hot stove, and there were clouds of steam hissing from natural vents in the earth, like something you might expect to see in the caldera of an active volcano. 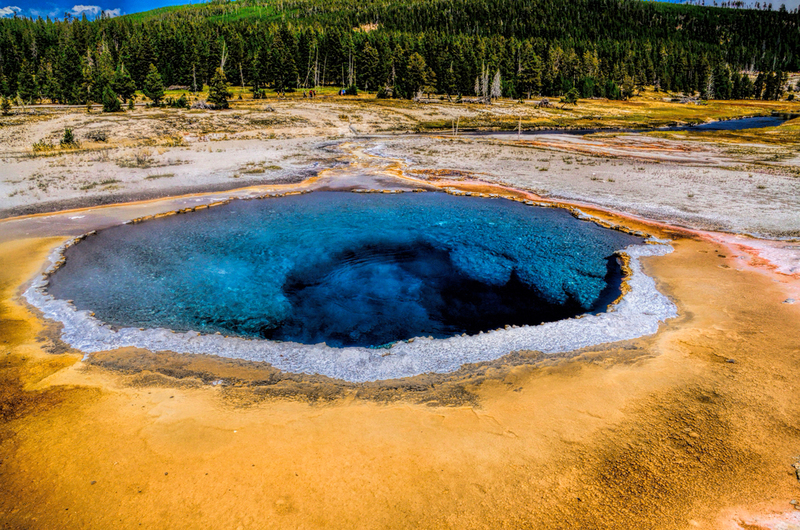 In truth, that’s exactly what this is: the heart of Yellowstone National Park is the massive crater of a super-volcano that’s blown, catastrophically, on at least three different occasions, the most recent eruption a mere 630,000 years ago. 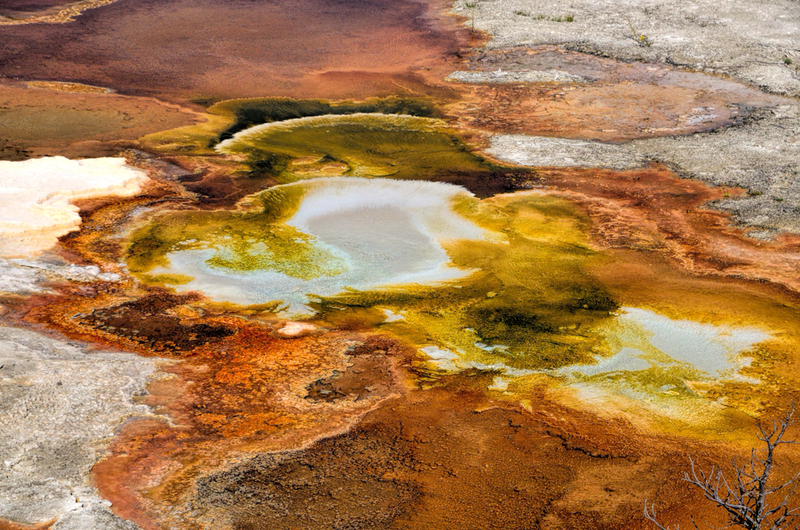 There is still a massive hot-spot comprised of molten rock--magma--which is unusually close to the surface beneath the forty-mile wide caldera, and it’s that huge pocket of magma that generates the heat that boils up the geysers and fuels the hot springs. 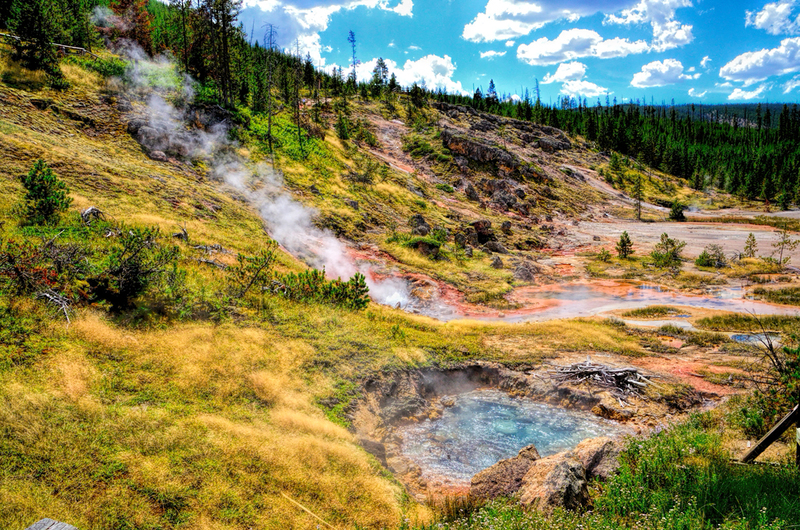 Altogether, the park contains almost 10,000 distinct geothermal features, representing half of the known geysers, hot springs, mud volcanoes, and bubbling multi-colored pools in the entire world! Doomsayers have long held the opinion that the ongoing volcanic activity in the aging caldera is a sure indication that another super-eruption is due, if not overdue, and that when it blows, it’s going to take out half the country and put an end to life on earth as we know it. The rest of us don’t worry too much about that sort of thing. 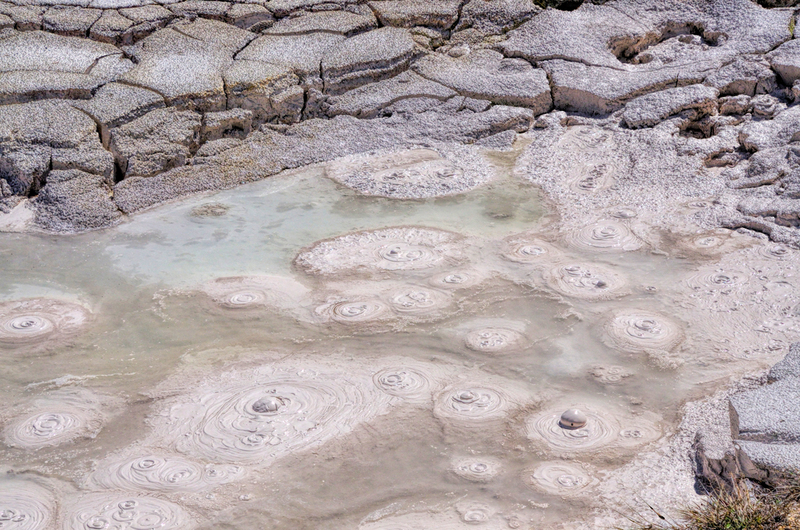 We simply enjoy and marvel at all the hissing and bubbling and bursting forth of these amazing geysers, mud volcanoes, and multi-colored pools, most of them surrounded by other-worldly accretions of calcified minerals, unlike anything you’ll ever see, anywhere else on the planet. From Beryl Spring we drove on to the Artists paint-pots, where we saw, among other things, bubbling vats of superheated mud. Mudpots, Artists Paintpots trail, Yellowstone N.P. 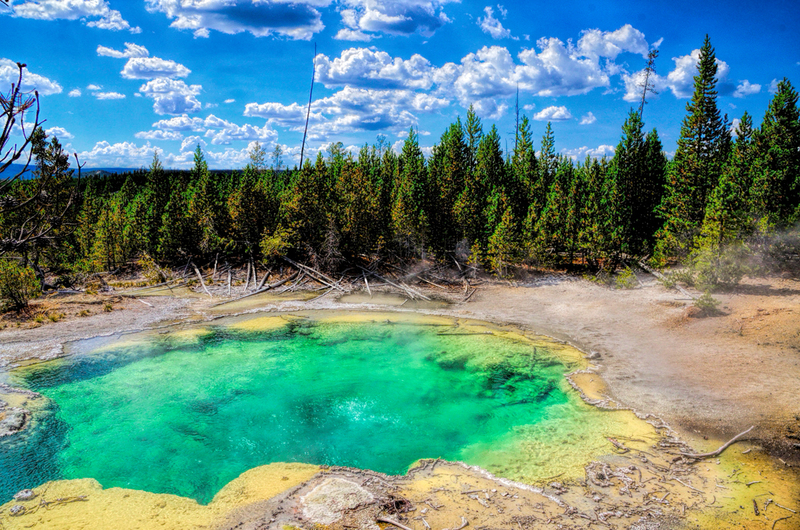 One of the true crowd-pleasing favorites in the Norris Geyser Basin was a spectacular pool called the Emerald Spring. The rocks lining the pool are colored yellow with a coating of Sulphur. When viewed through the clear blue water of the hot spring, the two colors combine to form a translucent green that’s as bright as any precious gemstone. And then there was the Grand Canyon of the Yellowstone, where we got a stupendous view of the beautiful canyon formed by the Yellowstone River, with lower Yellowstone Falls just visible at the top of the frame. After completing the north loop, we drove back out of the park the same way we’d come in, back to West Yellowstone, where we grabbed a bite to eat, and then headed to our National Forest campground at Baker’s Hole. It was a clear night, only a day away from the new moon, so the pitch-black sky came alive with stars, the Milky Way gleaming like a river of light across the dark expanse. Our timing was flawless: as we watched, there was a shower of meteors arcing across the scene like celestial fireworks, reminding us, in no uncertain terms, exactly how small we really are. When that truly amazing cosmic display petered to a halt, we crawled back into the tent and burrowed into our sleeping bags. Temperatures that night dropped very close to freezing, which was frigidly close to the limit for my old down bag, a relic from my youthful travels that was still serving me reasonably well after almost 45 years! We climbed out of our warm(ish) sleeping bags into our ice box of a tent, and from the tent straight into what started as a cold and gloomy day. We broke everything down and packed up our campsite with practiced ease (a process that is soooo much easier with two people). Next we made a quick stop in West Yellowstone for a fast food breakfast, and then headed straight back to the National Park. There were no lines to speak of at the West Entrance that early in the morning, so we sailed past the fee station, then east on US 191, which follows (roughly) the course of the Madison River. The road reached an intersection where it merged with US 89, right near the point where the Madison exits a confluence with the aptly named Firehole River. We turned south on the Grand Loop Road, (a combination of US 191, US 89, US 20, and US 287) which follows the Firehole River upstream into the Geyser Basin. 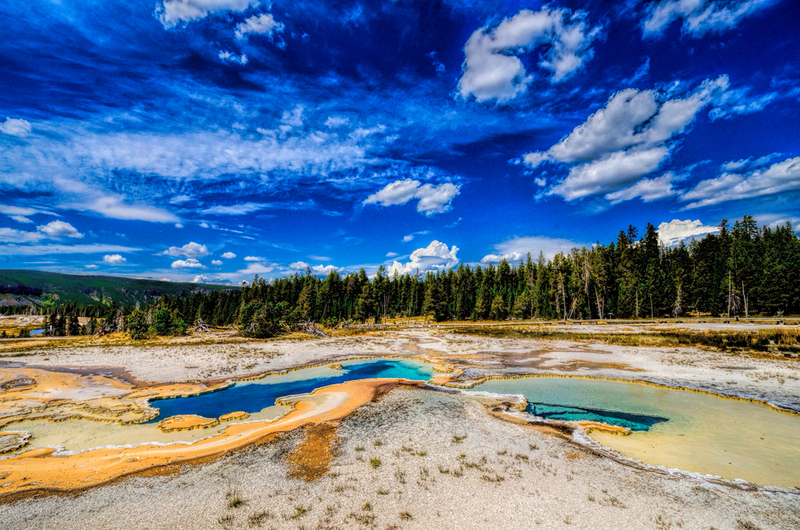 Yellowstone National Park is all about the geysers; water-filled vents in the earth that periodically erupt, shooting voluminous columns of steaming water skyward to a height of 100 feet or more. 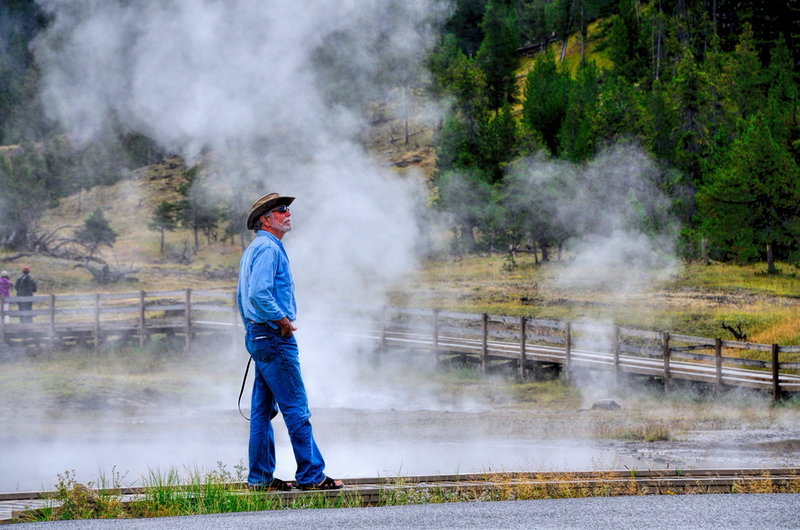 It’s not the only place on earth where geysers can be found, but Yellowstone simply has more geysers than anywhere else; more, in fact, than every other geyser field in the world combined. 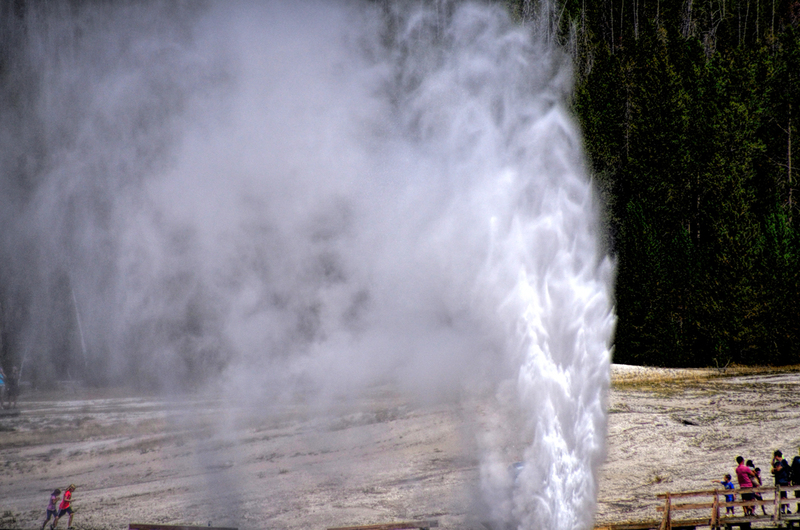 Yellowstone has the biggest, the tallest, the most predictable, the least predictable, the most built-up, as well as the most hyped-up geysers on planet earth. 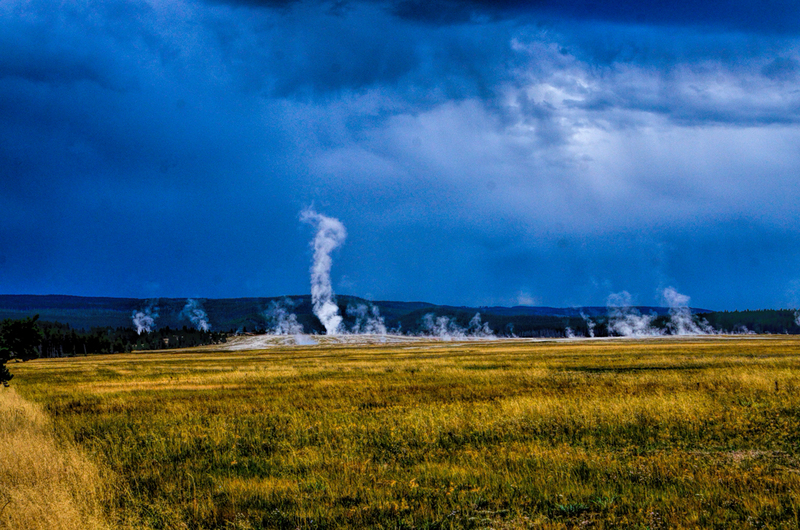 As we drove along that first stretch of the road leading south, there were dark, stormy skies and rain falling on the low hills edging the western horizon; in between, plumes of steam from the geyser pools coiled upward like the smoke from a hundred campfires. 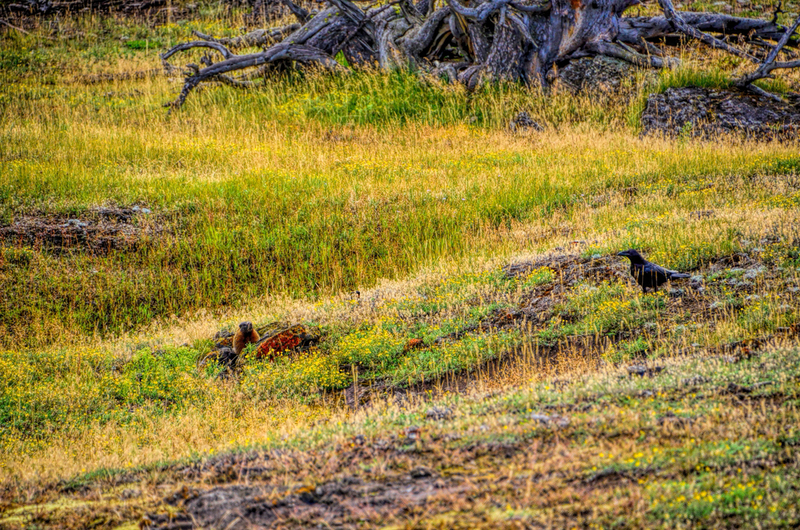 …when we observed an interesting interaction between two of the park’s smaller creatures, a raven and a marmot. The sequence brings to mind an Eskimo folk tale, in which a raven, tired of being mocked by the other birds as a “carrion eater,” decides to try eating a marmot, to prove that he could hunt live prey, just as well as the hawks and the owls and the eagles. 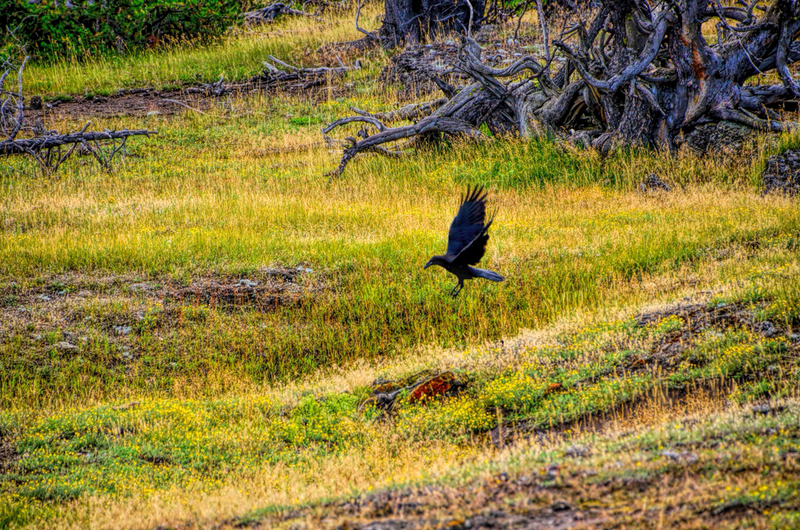 The raven surprised the marmot outside his hole, blocking his escape, but the marmot was clever. He appealed to the bird’s vanity, and tricked him into closing his eyes—which gave the furry little critter just enough time to dash between the raven’s legs and disappear into his burrow. There are a number of life lessons in that little parable, but this bird obviously never got the memo. The marmot was easily double his weight. If he’d caught it, I doubt it would have ended well for either of them! After the Lower Geyser Basin, we moved on to the Midway Geyser Basin, the location of the Grand Prismatic Spring, a multi-hued pool that is the largest of the many hot springs at Yellowstone. Even the steam coming off that thing is rainbow-colored, and the patterns created in the surrounding terrain by shifting bands of thermophilic algae are other-worldly. From the Midway Geyser Basin we drove just a few miles further south to the Upper Geyser Basin, which is the site of the most famous geyser of them all: “Old Faithful,” so named because of the spectacular eruptions that take place every 90 minutes or so, almost like clockwork. Old Faithful blows as much as 8,000 gallons of steaming water to heights of as much as 185 feet in eruptions that last as much as 5 minutes. This crowd-pleasing favorite is the one thing that everyone wants to see. 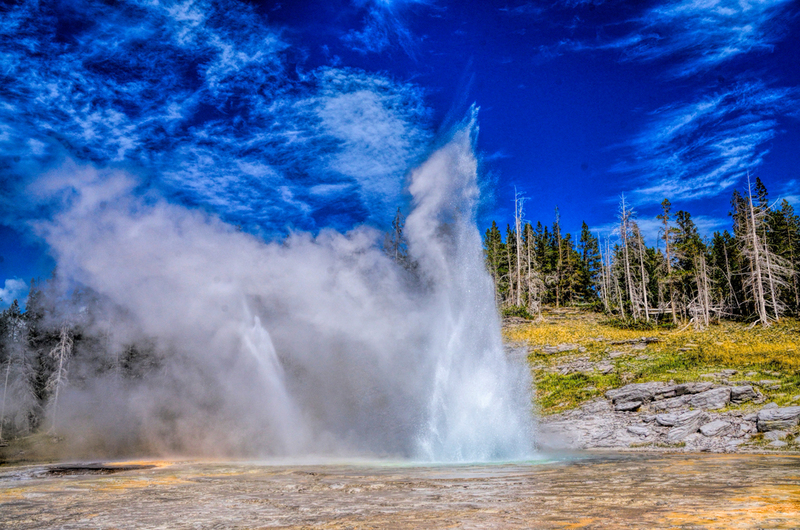 The area surrounding the famous geyser is known as the Old Faithful Historic District, and it’s the single most popular spot in this extremely popular National Park. That puts it at the epicenter of some seriously sizable crowds. Depending on the time of year, as well as on the time of day, the massive parking area might well be full to overflowing. It’s like a busy shopping mall at Christmastime, with dozens of cars slowly cruising the lot, waiting for someone to leave, and hoping they'll be first in line to seize the vacated parking space. 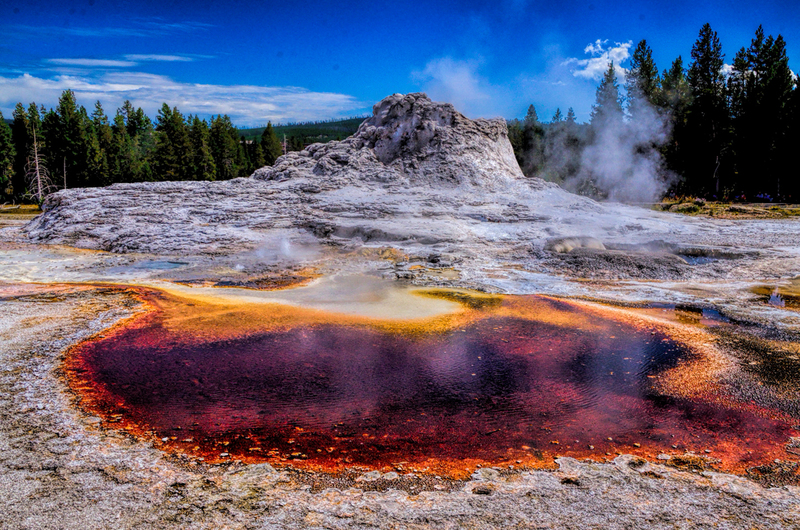 The famous geyser is easy to spot, even when it’s not erupting. There’s a big viewing area with concentric rings of outdoor seating. When you first arrive, be sure to look over that way. If it appears as though the seats are starting to fill up, or nearly so, stick around. That’s a sure sign that the countdown clock is getting down towards zero, which means it’s almost time for the next big show. 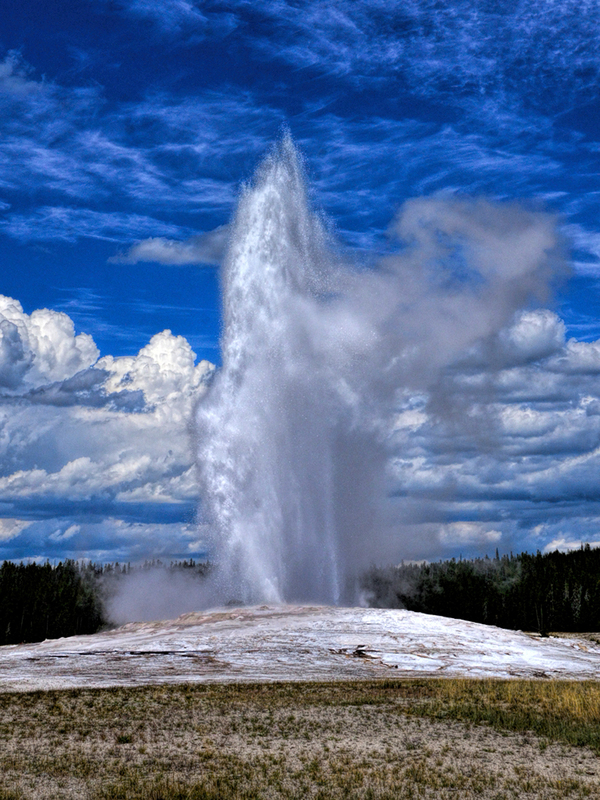 Old Faithful is not the biggest, or the tallest geyser in the world. Those honors belong to a geyser called Steamboat, which is also at Yellowstone, but up in the Norris Geyser Basin, which Carl and I had visited the day before. That geyser shoots massive amounts of water and steam to heights of as much as 300 feet, but its eruptions are by no means predictable, and the dormant periods between eruptions can last as long as 50 years! There are several other famous geysers quite close to Old faithful in the Upper Geyser Basin, including Beehive Geyser, so named for the four-foot tall beehive shaped cone, a build-up of accreted minerals that has formed around the vent. The Beehive spouted off for us while we were waiting for Old Faithful, starting with a tremendous roar—the sound of venting steam—followed by an eruption that lasted a good five minutes. We were very lucky to see that one, since it only goes off once a day in the summertime. 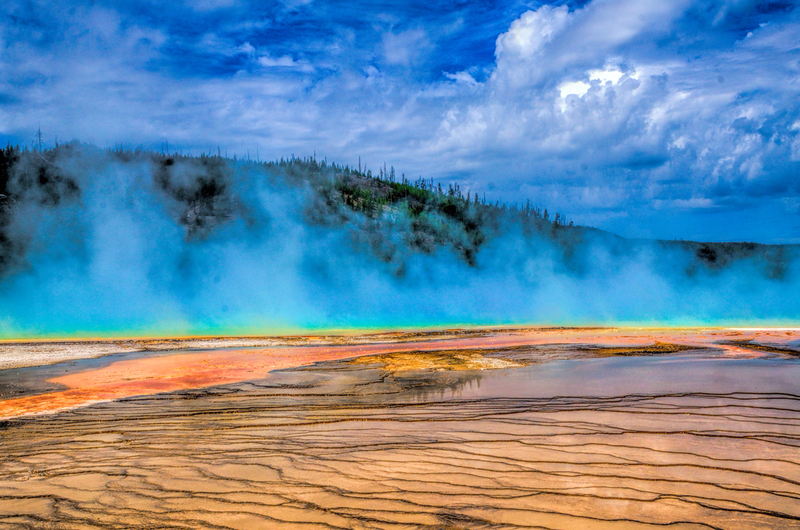 And this one, created by the outflow from Castle Geyser (in the background). 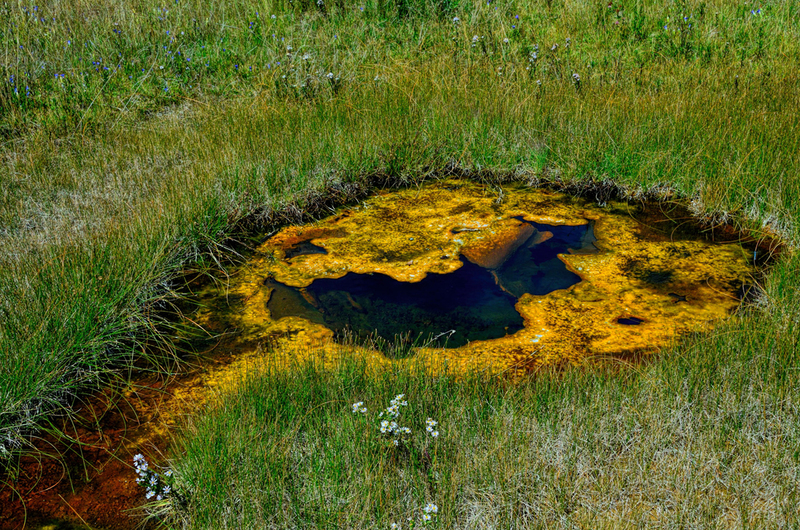 In Yellowstone, if there’s water, even a small pool, it’s hot water, and where there’s hot water, there’s always stuff growing in it. 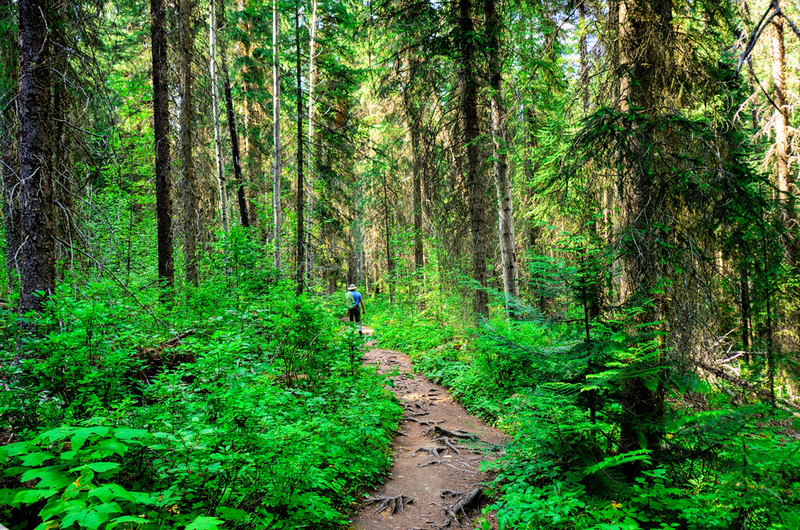 As much as we enjoyed the colorful hot springs pools, the best thing about the Geyser Hill Trail was the geysers! 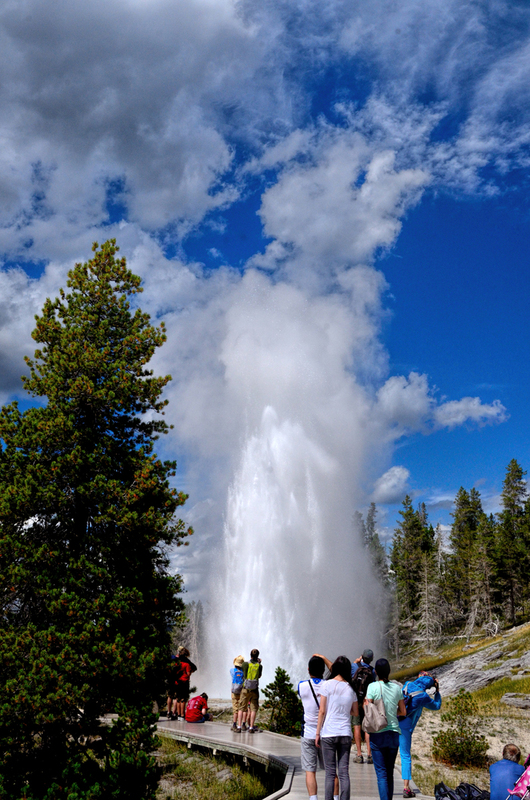 There was a big crowd gathered around Grand Geyser in anticipation of its next eruption. 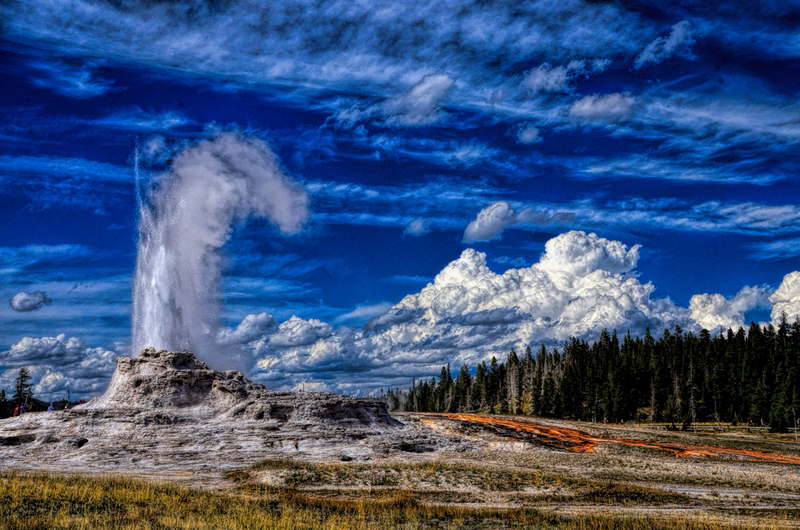 Grand Geyser is considered predictable, with an eruption every 7 to 15 hours, but that’s not like Old Faithful. If you really want to see this one spout, it takes a fair amount of patience, and probably a little luck. We were definitely lucky; we didn’t have to wait long at all before that sucker exploded in a gushing, steaming burst that shot well over a hundred feet in the air. The geyser settled down after a few minutes, reduced to a bubbling, gurgling pool of water, but then it went off again,even bigger than the first time, much to the delight of the folks who, like us, were lucky enough to catch this thing in action. I’d have to say that my favorite of all these spouting geysers, based purely on aesthetics, would have to be Castle Geyser, named for the unusually large accretion of minerals around the vent. Like Grand Geyser, you need both luck and patience to catch the Castle in the act. We actually hung around for well over an hour watching it spit and sputter, and we’d just about given up when it roared to life and erupted for real, spouting plumes of water and steam that rivaled the banks of clouds that rimmed the horizon. The weather had cleared, but only part way; those fluffy cotton candy clouds have a way of turning dark and morphing into thunderheads, so we kept a close eye on that beautiful sky. We left the Geyser Basin and drove east on Grand Loop Road, climbing up and over the continental divide at 8,262 foot Craig Pass. 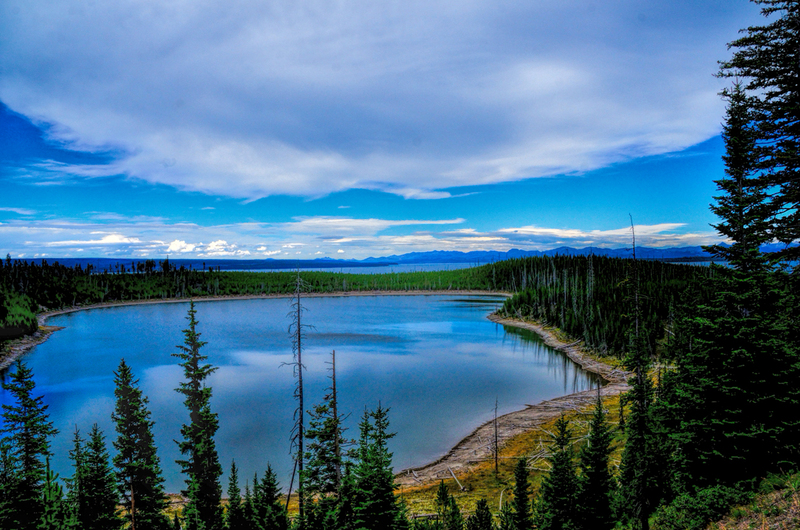 The eastern section of the National Park is dominated by Yellowstone Lake; at 136 square miles, it’s the largest body of water in the area and, quite frankly, after all the drama in the geyser fields, there’s not a whole lot going on over there. The storm clouds were thickening, so the light was lousy for photos. We poked around the West Thumb section of the lake, where there were more geysers and hot springs, but it was starting to get a bit late in the afternoon. 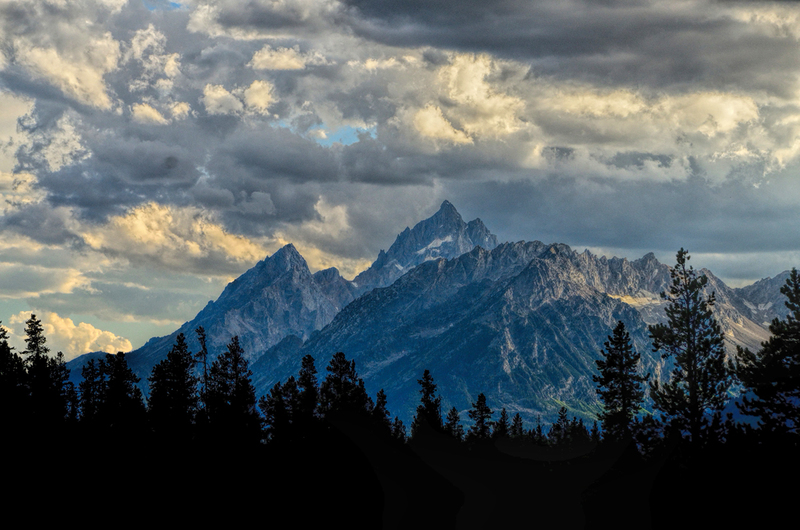 We wanted to spend the next day exploring Grand Teton National Park, which is immediately adjacent to Yellowstone to the south. We weren’t sure yet where we’d be spending the night, so we figured we’d best start down in that direction, to see what might be available. 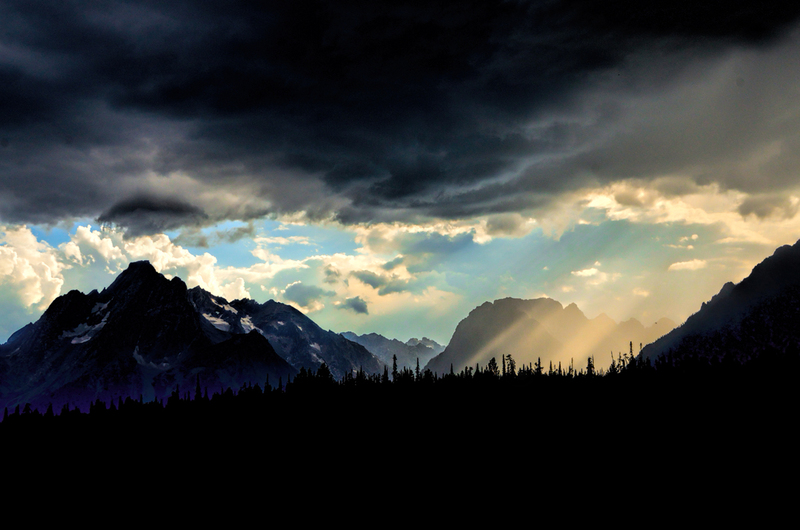 We’d no sooner driven out of Yellowstone and into Grand Teton when a huge thunderstorm boiled up out of the jagged peaks of the Teton Range, and the clouds burst. We drove south in pouring rain, stopping at every campground we came to: Flagg Ranch, Sheffield, Lizard Creek, but everything--and I do mean everything was full up. The sun went down in a gorgeous display, but the moment it dropped over the horizon, the temperature dropped at least 20 degrees, and it was still raining. We were a little bit desperate by the time we pulled into Colter Bay Village, where the campground, like all the others, was totally full. The attendant who gave us the bad news suggested we check the hotel by the marina, where they had rustic cabins for rent. I stopped in the office to ask about vacancies, even though I was pretty sure it would be a waste of time. When I walked in, the gal at the desk was just hanging up the phone. “Do you have anything at all?” I asked hopefully. The answer to that was an unequivocal yes! Shortly after we checked in, the rain stopped, so we walked down to the restaurant by the marina and had a quite decent dinner. After we got back to the cabin, the rain started again, coming down hard, and the temperatures dropped even further. We were warm as toast in our rustic cabin, incredibly thankful that we weren't spending that night in my tent! At $224, our cabin at Colter Bay was the most expensive lodging on this whole trip, but under the circumstances, it was well worth it! By eileenmalia in forum Gear-Up!